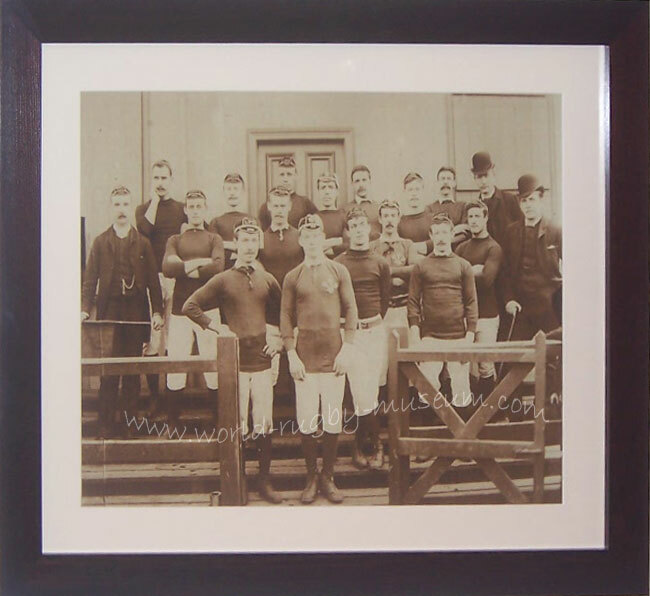 ANTIQUE PRINTS - Genuine Antique prints - mounted, ready for framing. 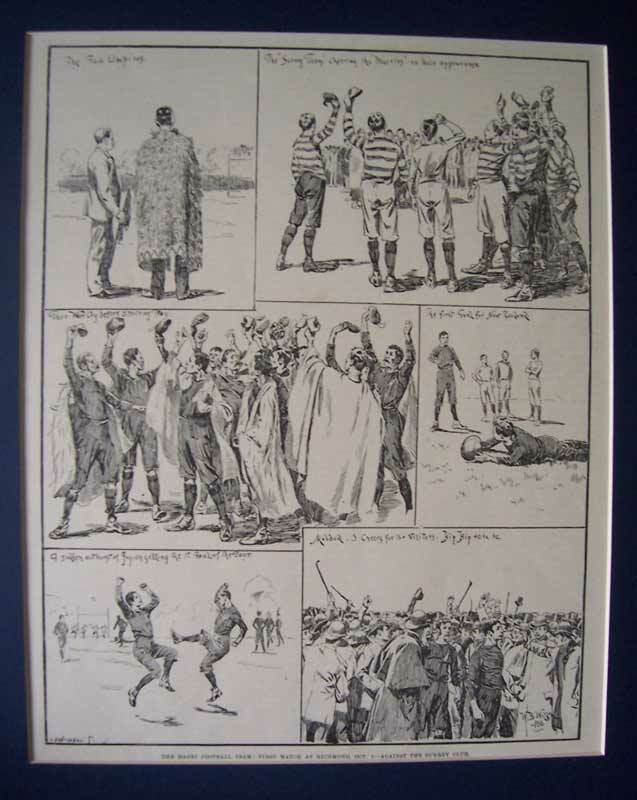 Surrey v NZ Native team 1888, original print from the front page of the Illustrated London News dated 1888. 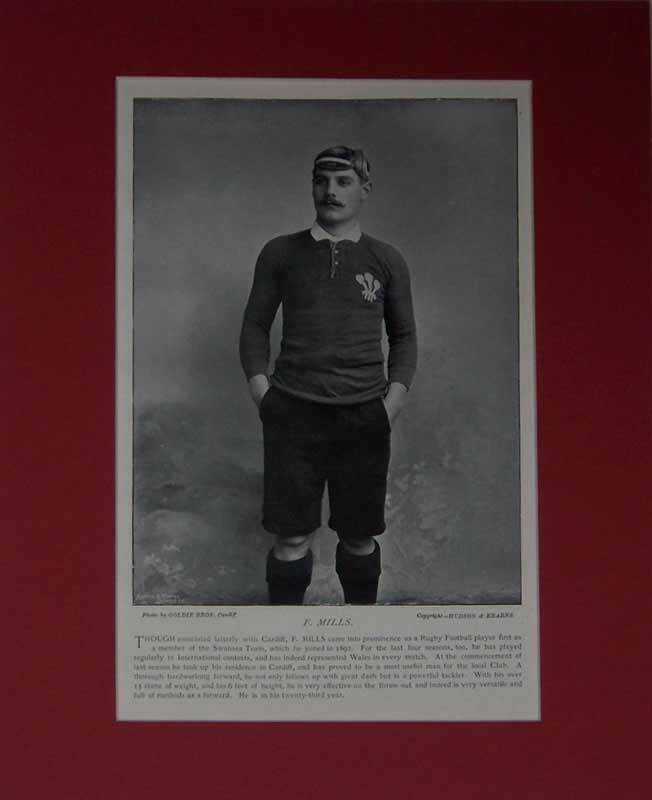 France v New Zealand 1906, the last match of the 1905/6 All Black tour, team photos on a full page of a French publication. 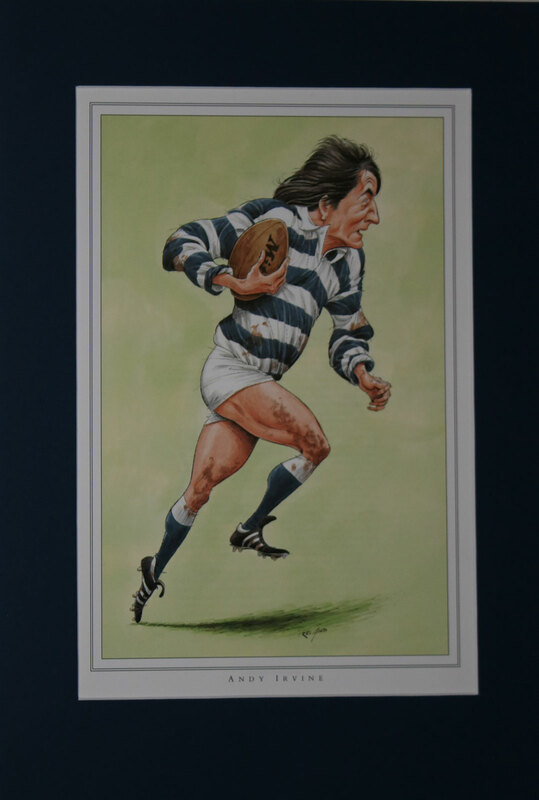 The print is mounted ready for framing. 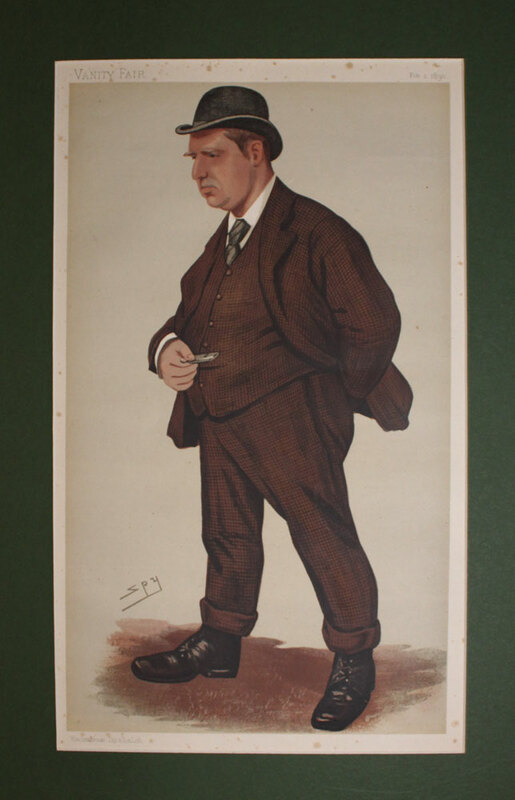 total size 18" x 14"
Original Vanity Fair print by Spy dated Feb 1 1890 of G Rowland Hill secretary of the Rugby Football Union. 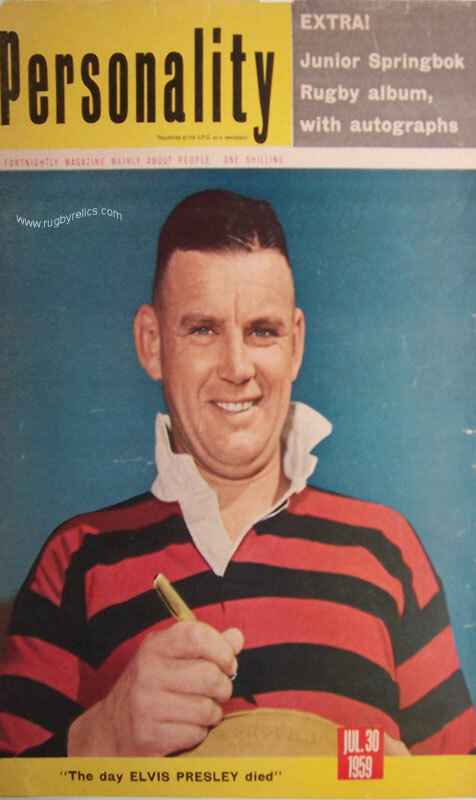 Hill was the person to be knighted for services to the game in 1926. 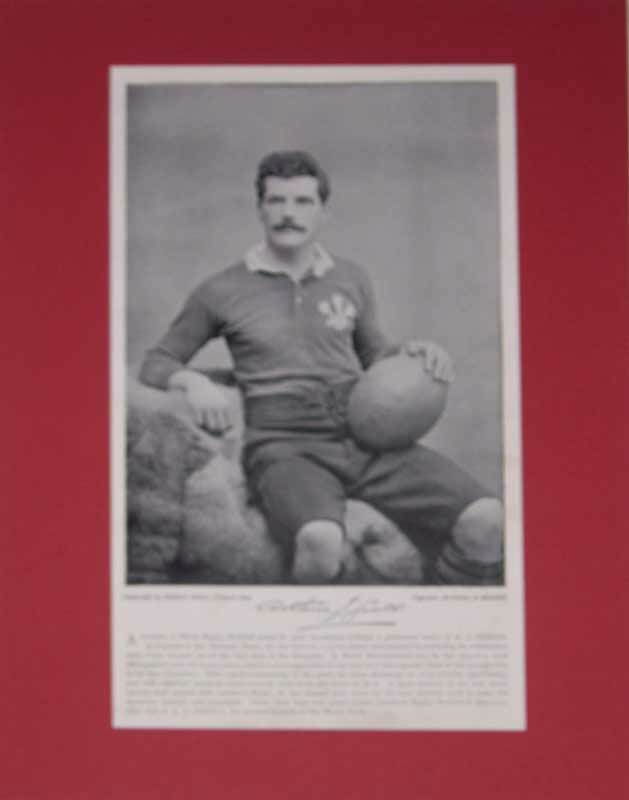 The print is mounted ready for framing, total size 18" x 14"
1924 All Blacks, published by Wills, Three Castles Cigarettes, together with supplementary heights, weights & itinerary chart, the print has some light discolouration to the border and a very small tear (approx 1cm) to the right hand edge which has been repaired neatly with tape. 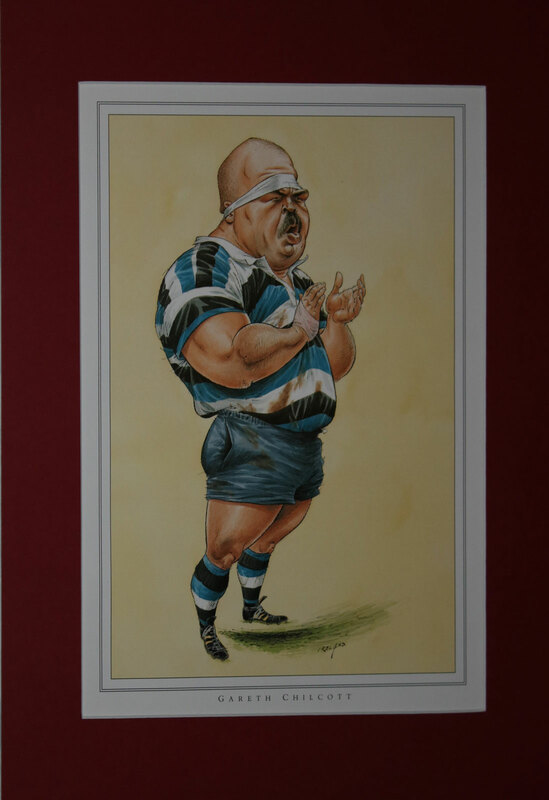 Size 20 x 15" ( 51cm x 38cm). 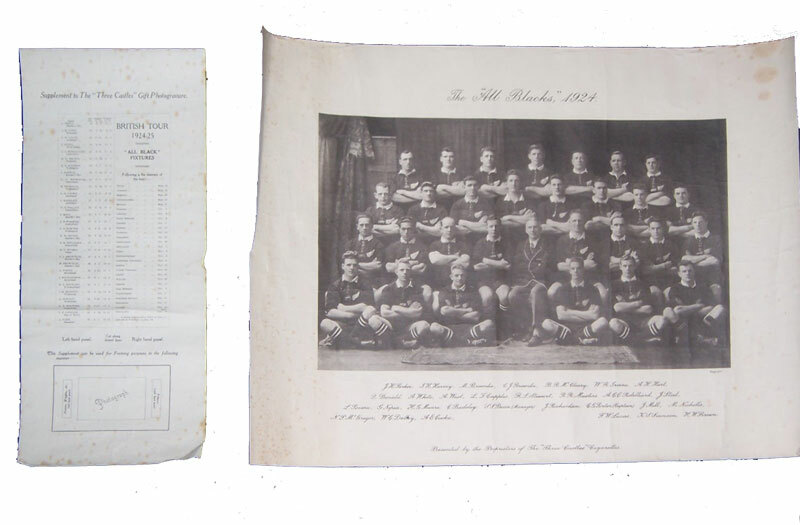 An original print from 1924 of the All Black Invincibles. 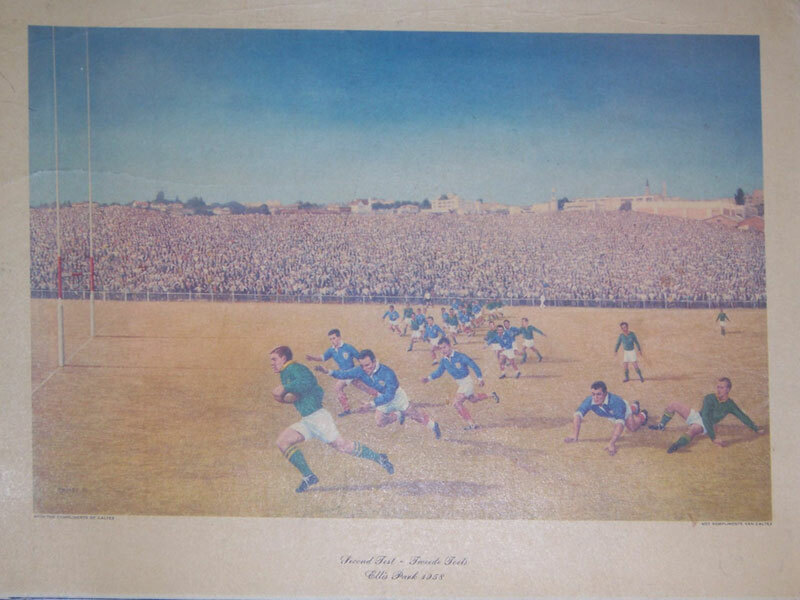 SA v France 2nd Test 1958 print by Caltex, illustration by Emsley, board backed, total size 21" x 16" - 53cm x 40cm, some creasing around the edges with one crease, approx 6" inches on left hand edge. 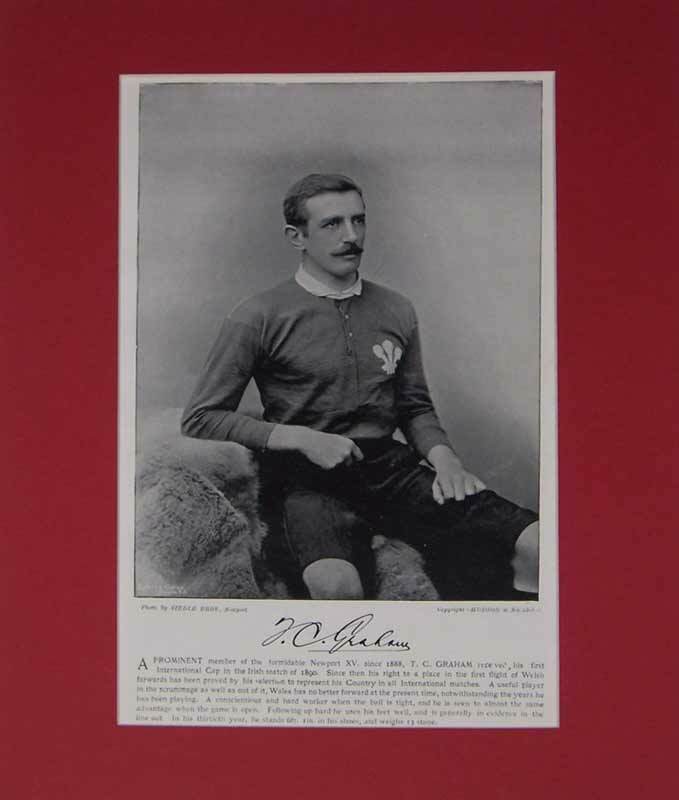 Original 1896 prints from 'Famous Footballers' a publication that appeared in the 1890s. 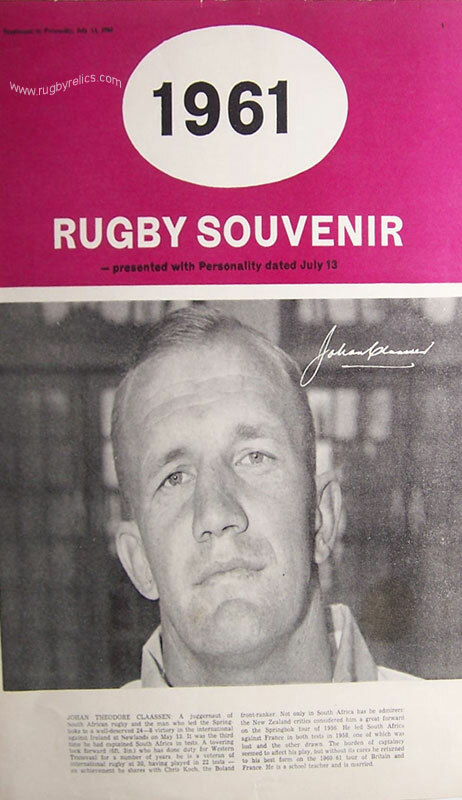 Each player pictured has a facsimile autograph and biographical details below the photograph. 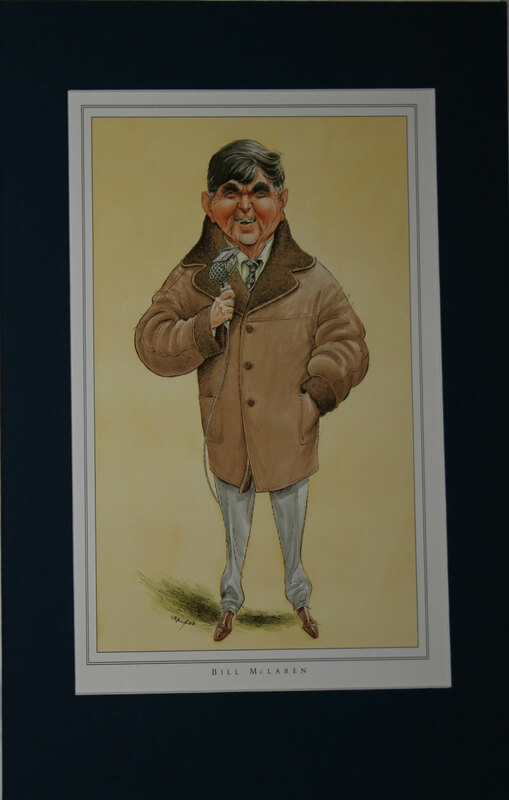 Photographs are nicely posed and taken in a studio setting. 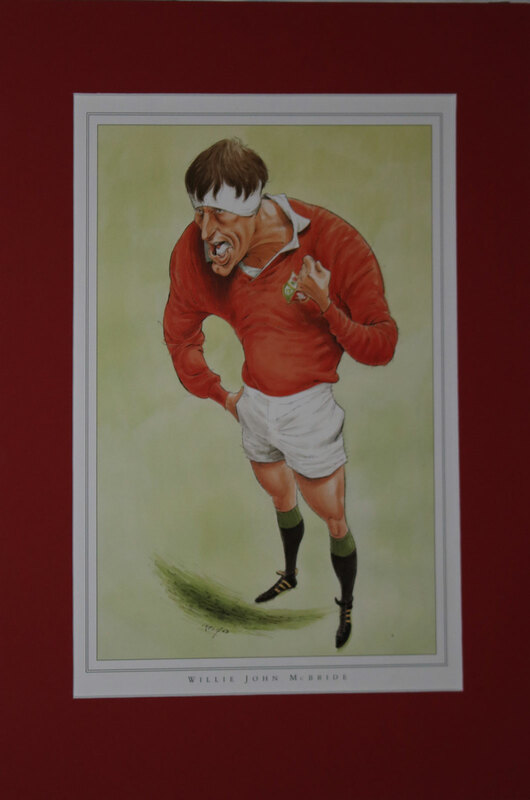 The total size of each print including the mount is 16" x 12" (41cm x 30.5cm). 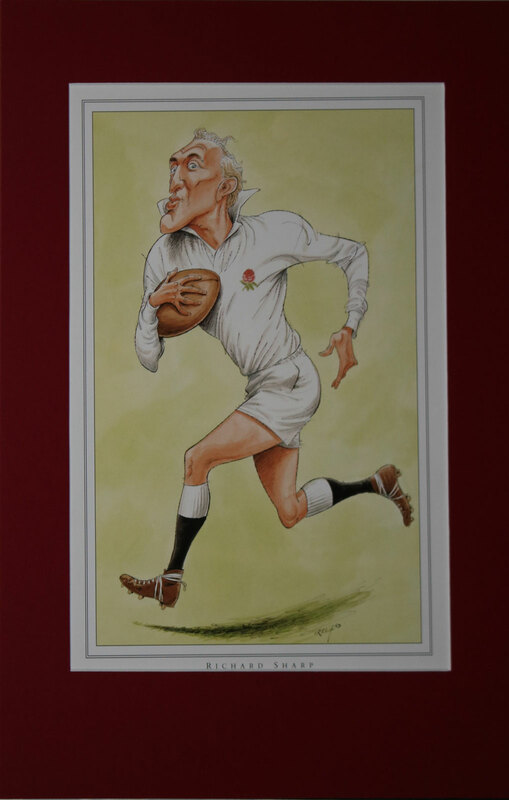 These prints can be purchased framed & glazed for an extra £35.00, see example illustrated left, please click on the add to cart button below to add the framed option to the print - please adjust the quantity if you require more than one print framed. 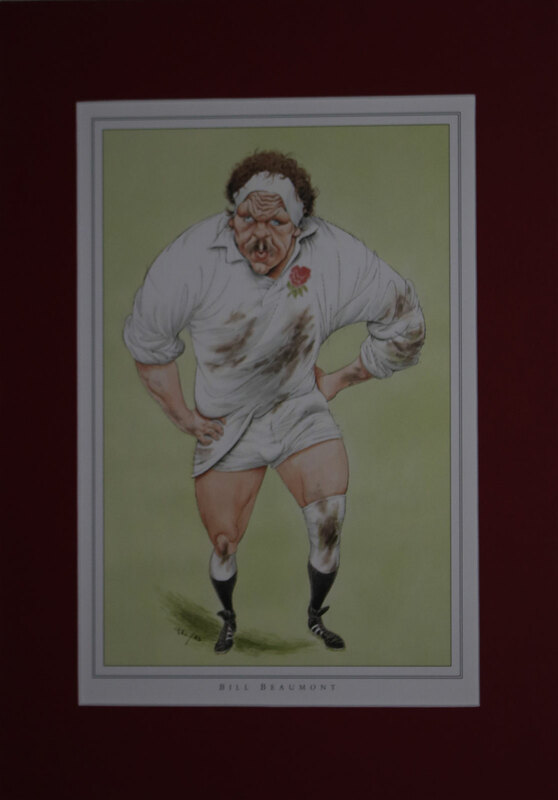 The total size of each print including the mount is 16" x 12" (41cm x 30.5cm). 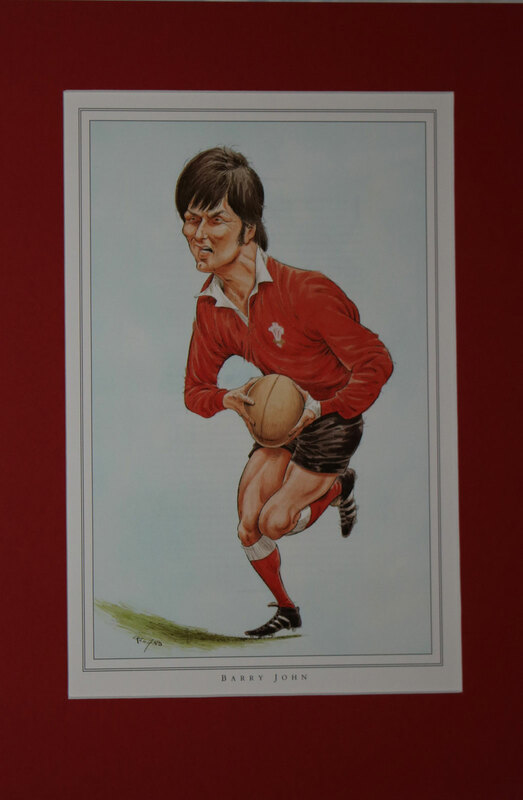 F. MILLS, CARDIFF, SWANSEA & WALES. 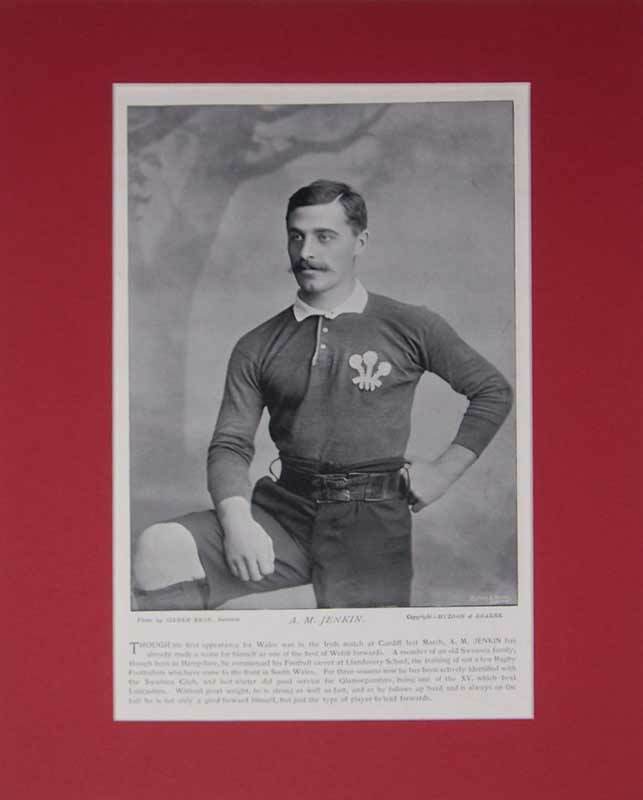 A. J. GOULD, NEWPORT & WALES. 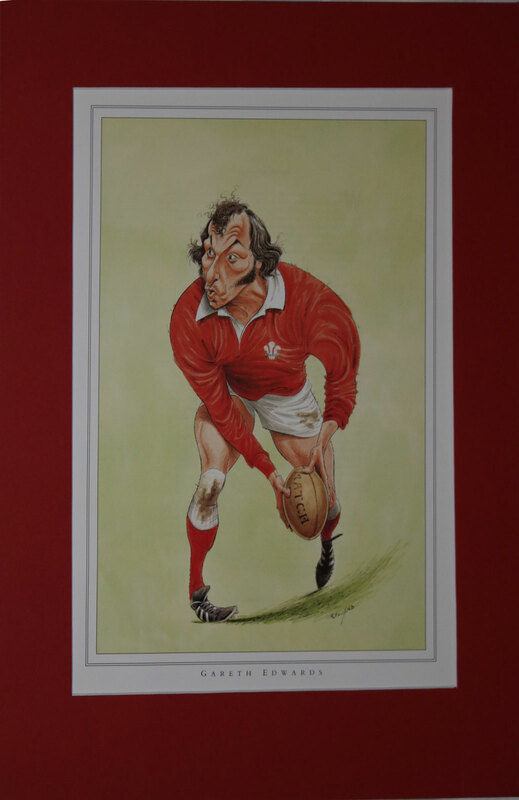 W. P. (PERCY) CARPMAEL, BARBARIANS. 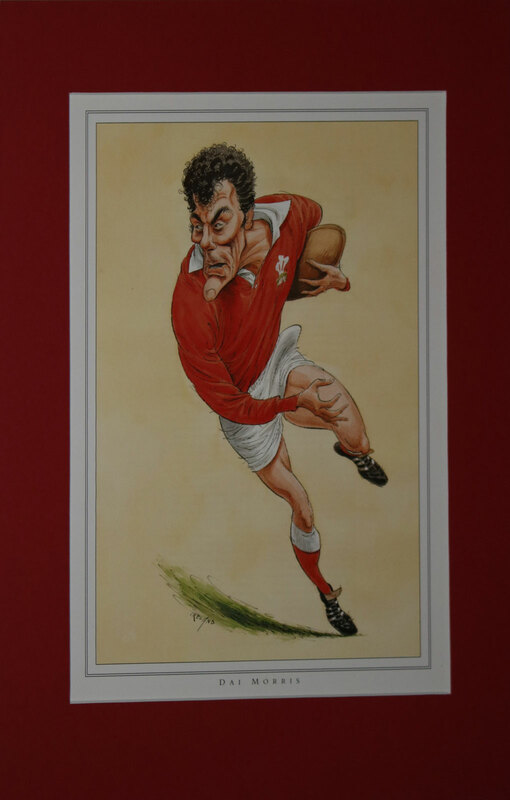 A. M. JENKIN, SWANSEA & WALES. 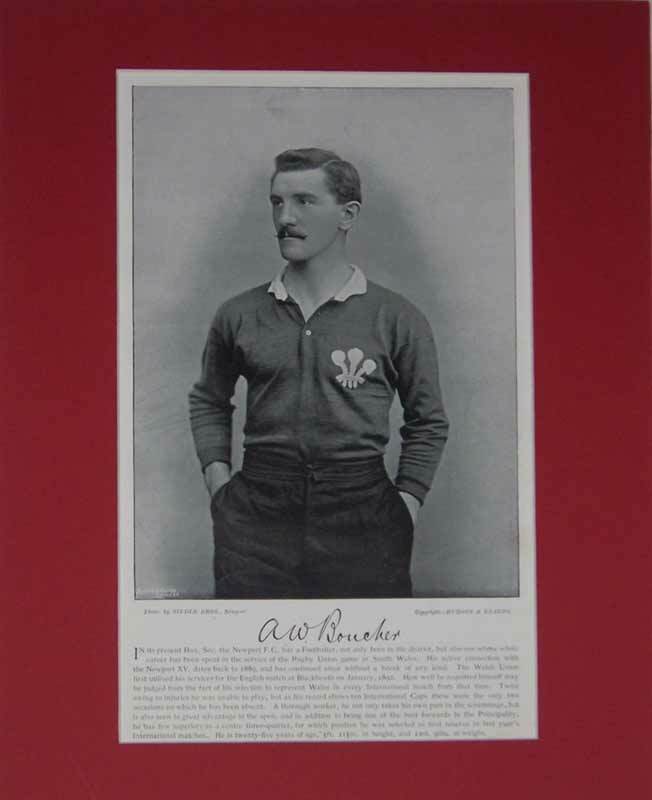 A. W. BOUCHER, NEWPORT & WALES. 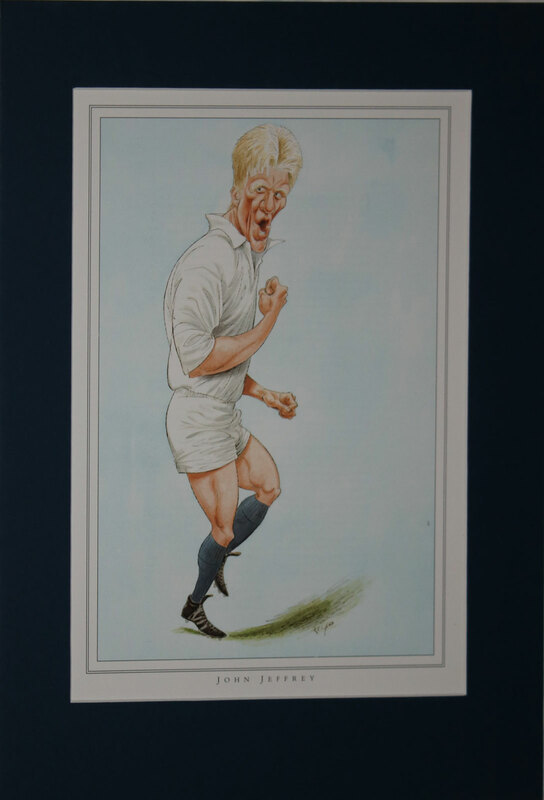 CHESHIRE – This is a genuine 1895 print, a plate from the Famous Footballers book of this date. 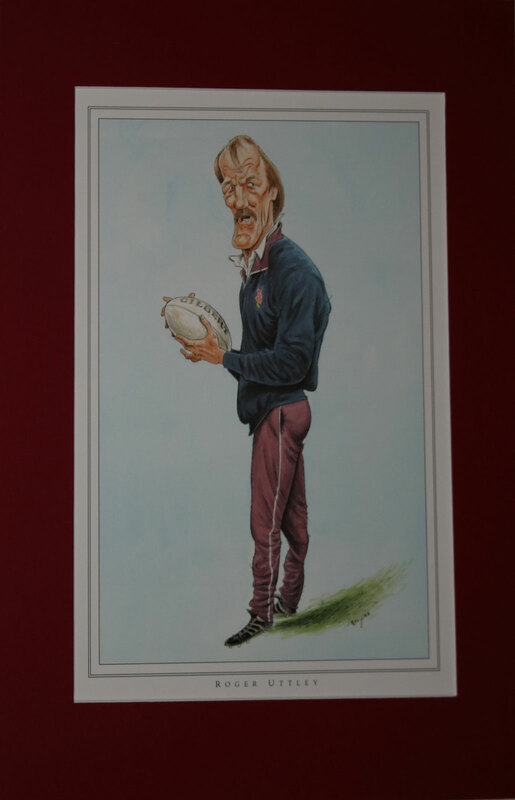 The players pictured in the photo are as follows: CC.Harvey(hon. 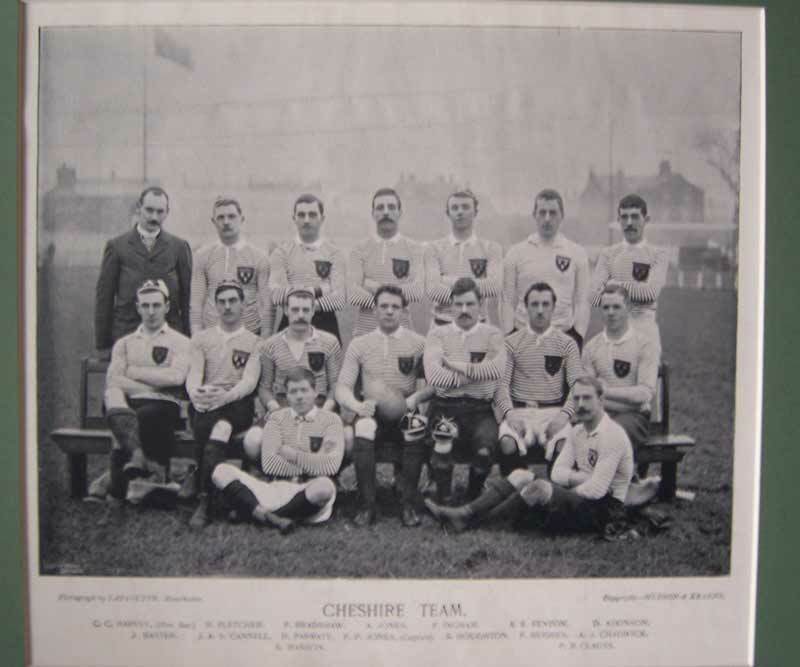 sec), H.Fletcher, F.Bradshaw, A.Jones, F.Ingham, AE.Fenton, D.Atkinson, J.Baxter, JAS.Cannell, H.Parratt, FP.Jones (captain), S.Houghton, F.Hughes, AJ.Chadwick, S.Hanson, PR.Clauss. 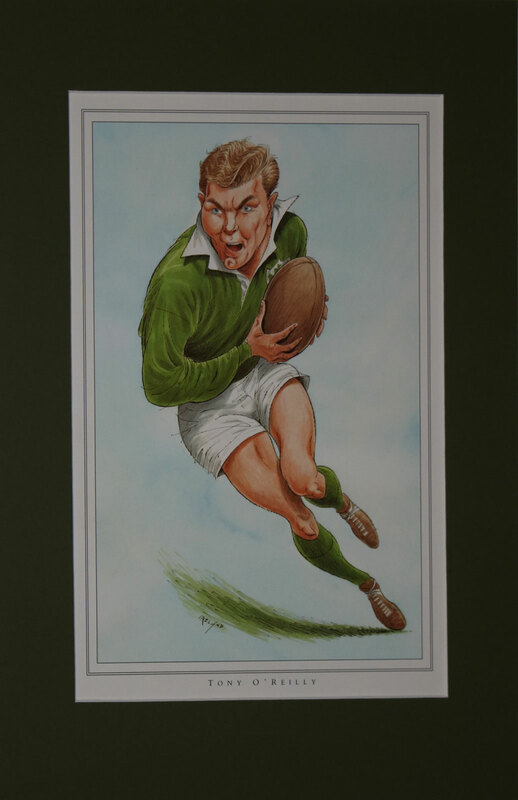 Mounted in a green surround the total size of the print including the mount is 40cm x 30cm (16” x 12”). 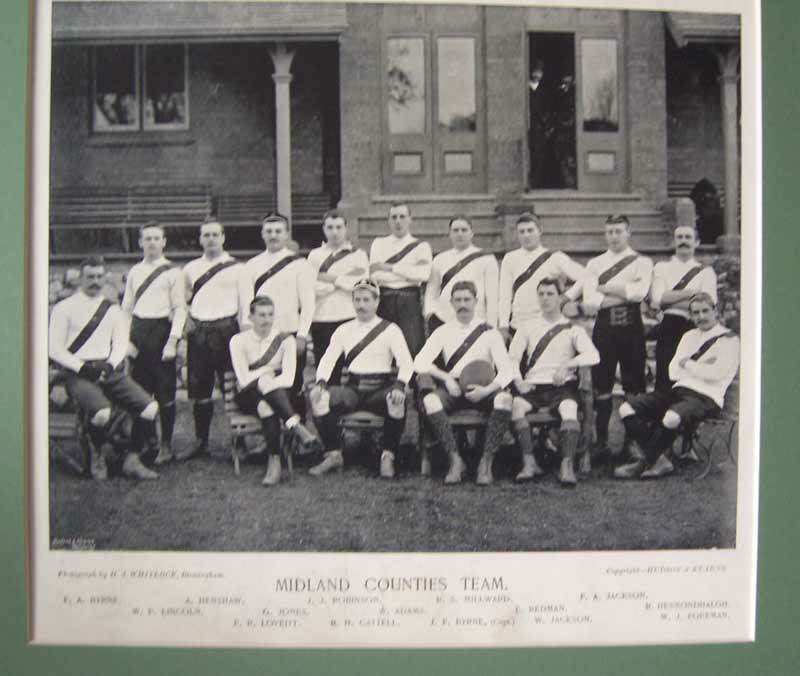 MIDLAND COUNTIES – This is a genuine 1895 print, a plate from the Famous Footballers book of this date. 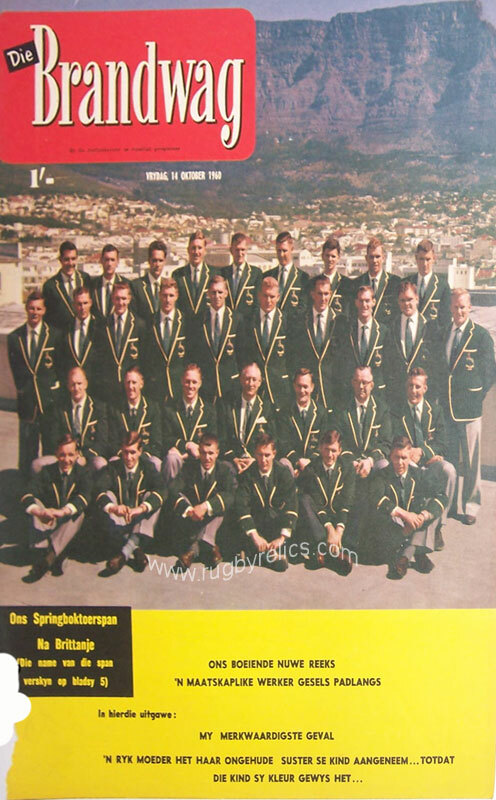 The players pictured in the photo are as follows: FA.Byrne, A.Henshaw, JJ.Robinson, RS.Millward, FA.Jackson, WP.Lincoln, G.Jones, W.Adams, E.Redman, R.Hesmondhalg, FR.Loveitt, RH.Cattell, JF.Byrne (captain), W.Jackson, FJ.Foreman. 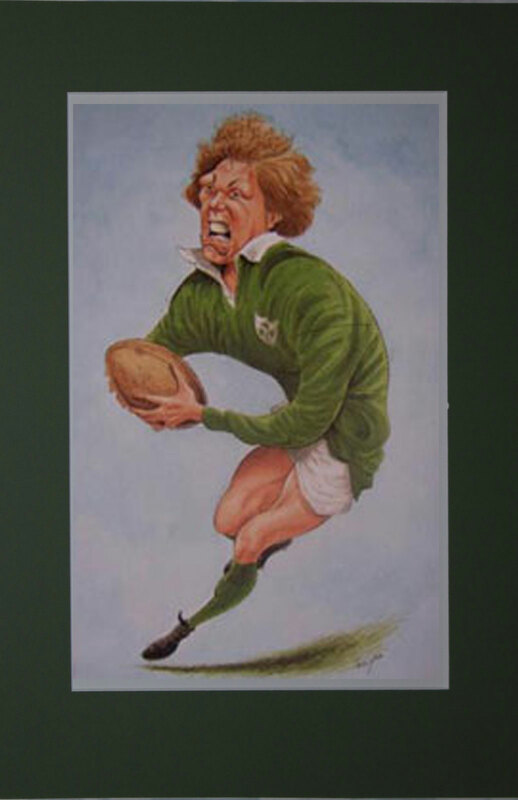 Mounted in a green surround the total size of the print including the mount is 40cm x 30cm (16” x 12”). 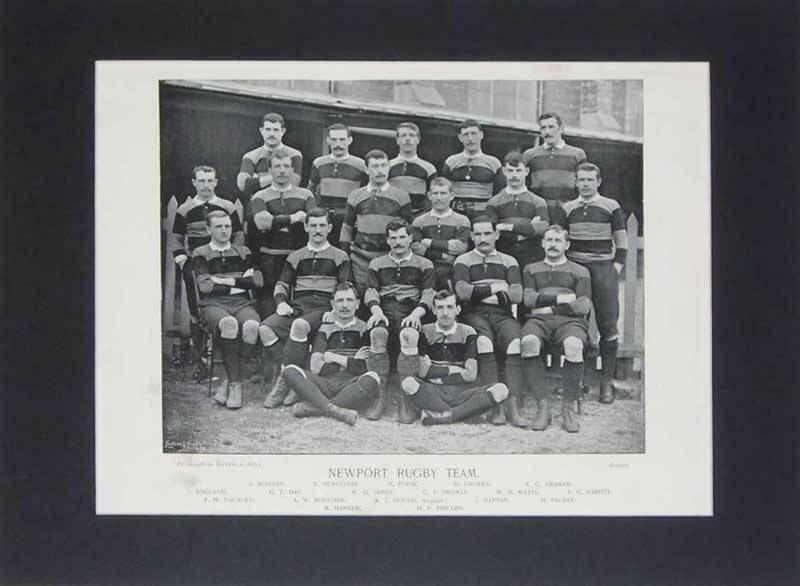 NEWPORT - An original 1896 print of the Newport team. 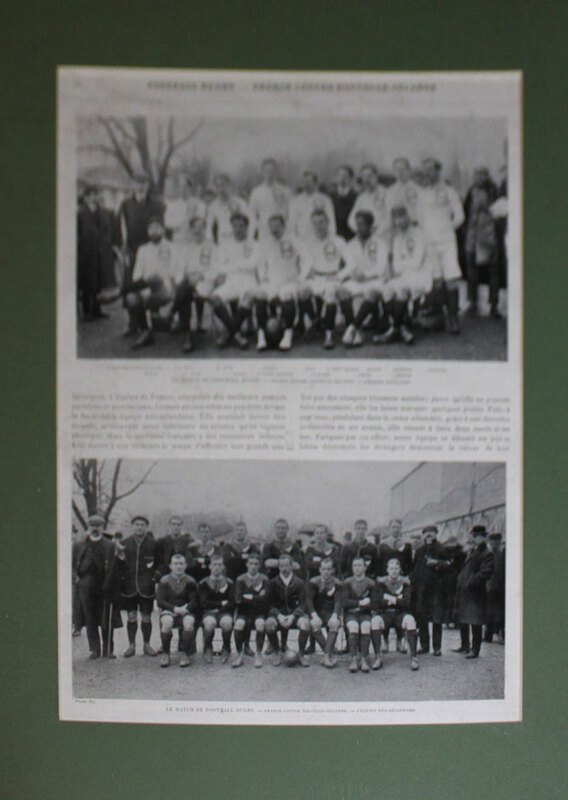 The players included in the photograph are: J. BOWLEY, T. NEWCOMBE, T. POOK, W. GROVES, T. C. GRAHAM, T. ENGLAND, H. T. DAY, W. G. JAMES, C. J. THOMAS, W. H. WATTS, F. C. PARFITT, F. H. DAUNCEY, A.W. 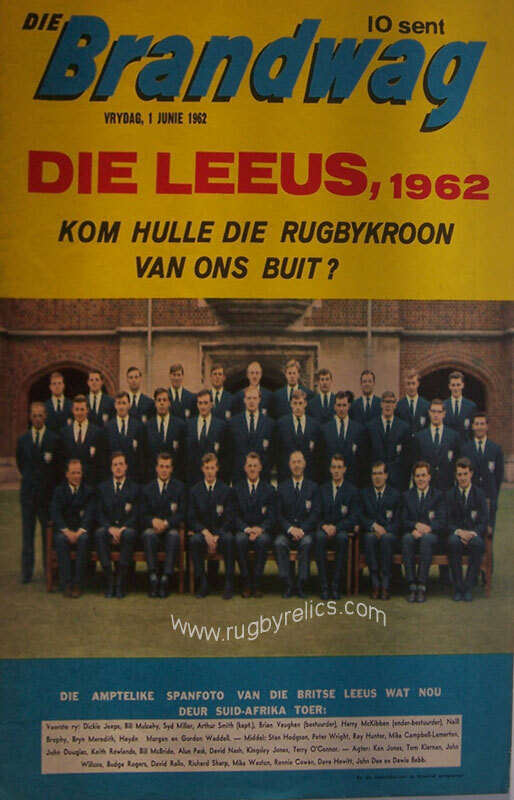 BOUCHER, A. J. GOULD (captain), J. HANNAN, H. PACKER, M. HANNEN, H. P. PHILLIPS. 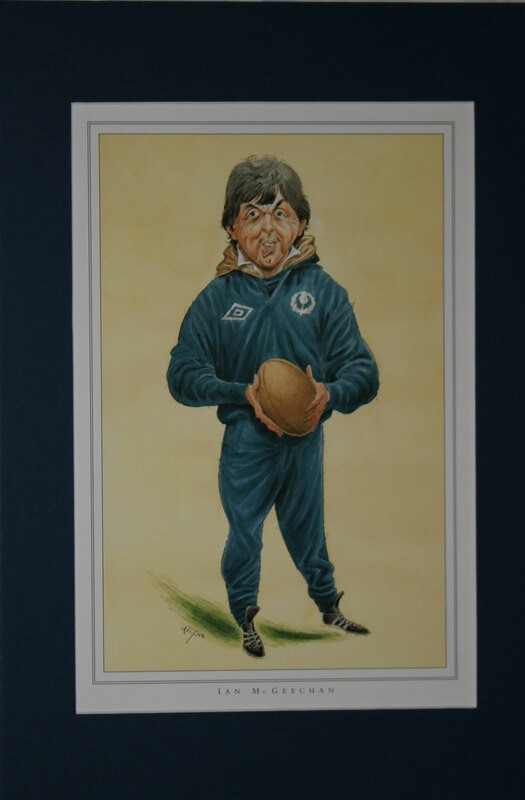 The total size of this print including the mount is 16" x 12". 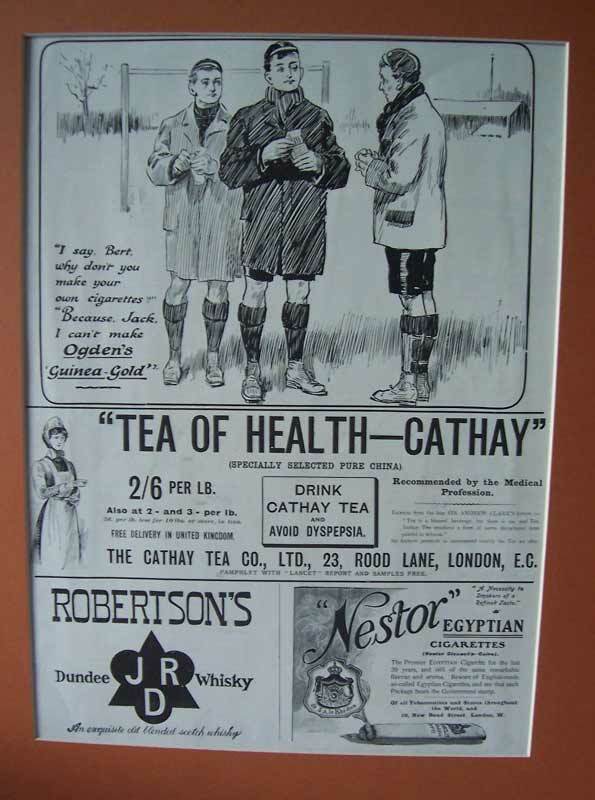 ( 41cm x 30.5cm). 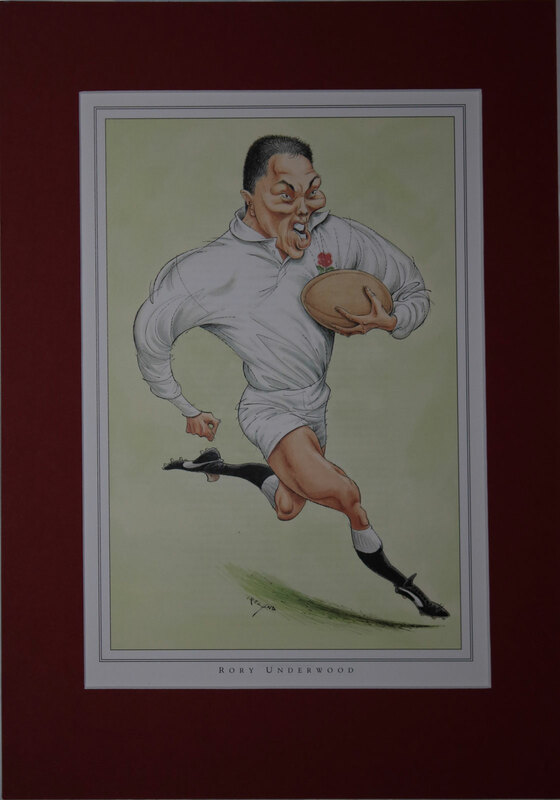 A modern photographic reproduction print of an illustration by S.T. Dadd. 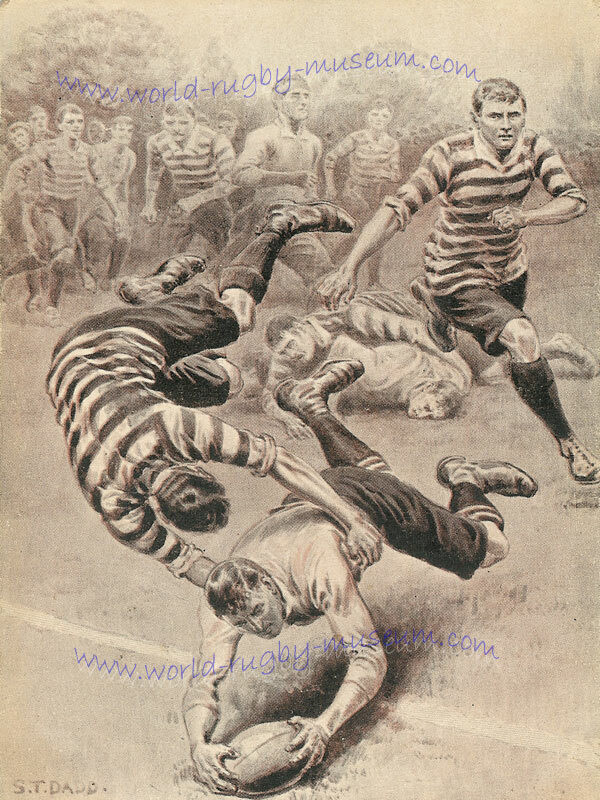 Dating from the turn of the century the illustration is titled 'Nearly In' and shows a player being tackled into touch just before the try line. 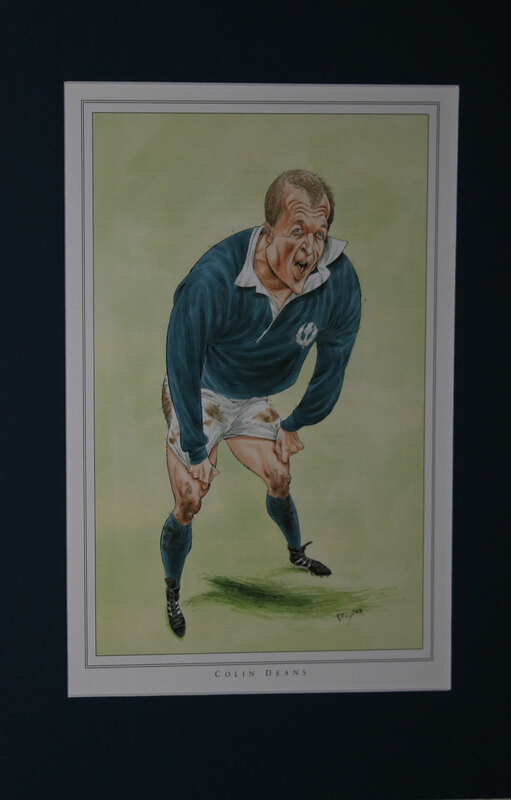 A modern photographic reproduction print of an illustration by S.T. Dadd. 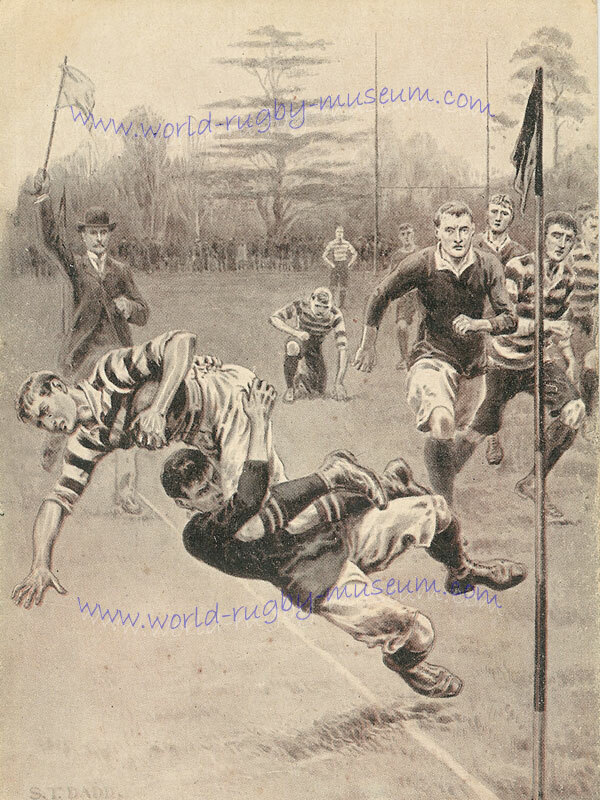 Dating from the turn of the century the illustration is titled 'A Try' and shows a player scoring a try. 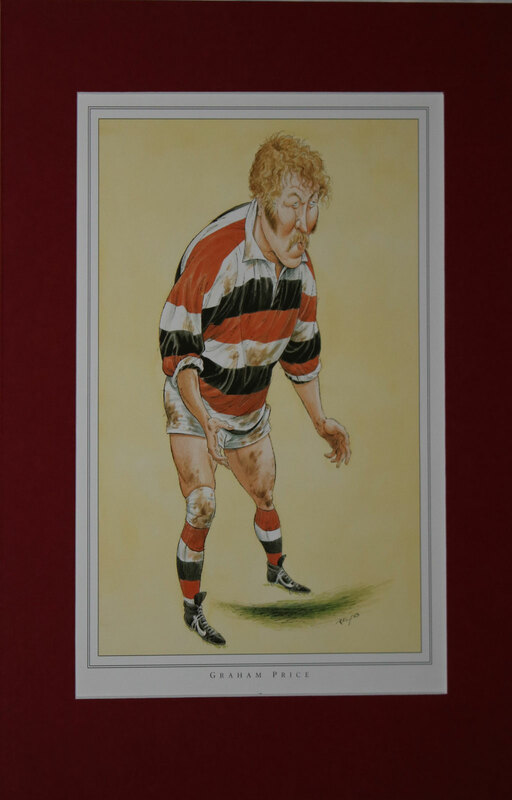 The print measures 18" x 12" (46 cm x 30 cm). 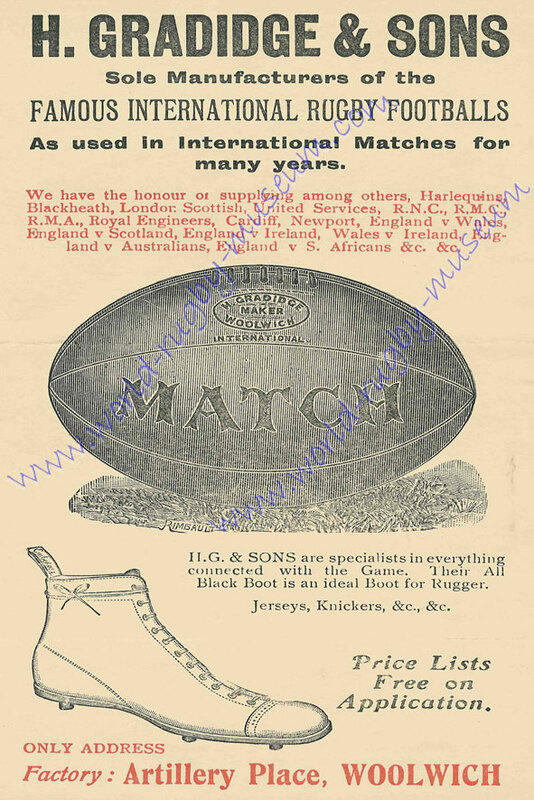 A modern photographic reproduction print of a 1912 Gradidge advertisement for balls & boots. 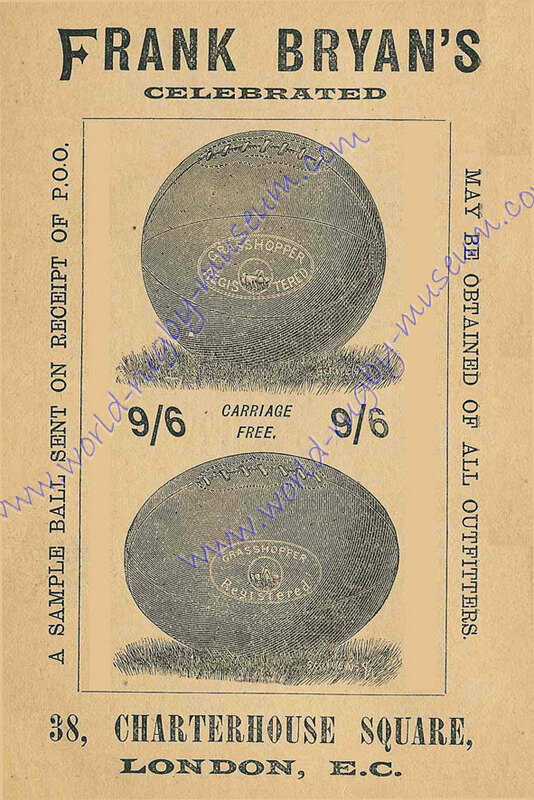 A modern photographic reproduction print of a Bryan's advertisement for rugby and soccer balls 1896. 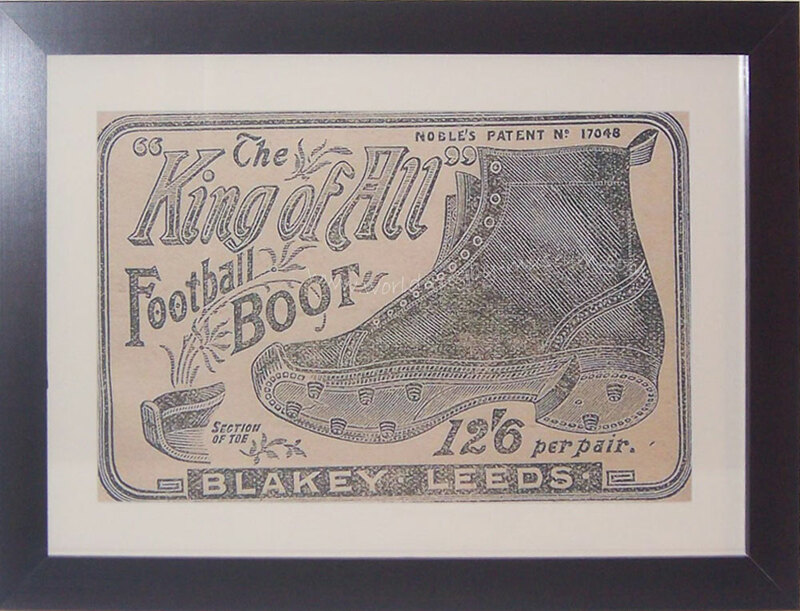 A modern photographic reproduction print of a 'King of All Football Boot' advertisement 1896. 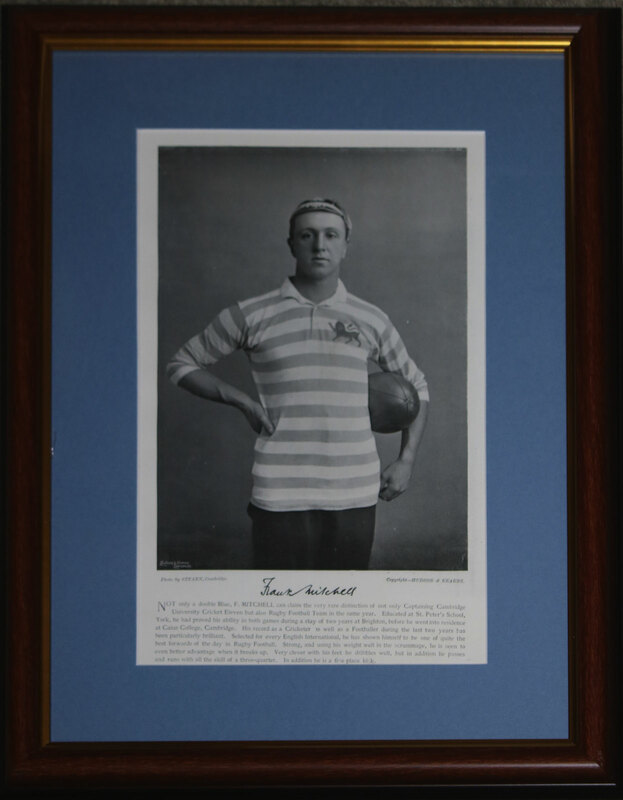 A modern photographic reproduction print of a Perrins & Burke' ball advertisement 1910. 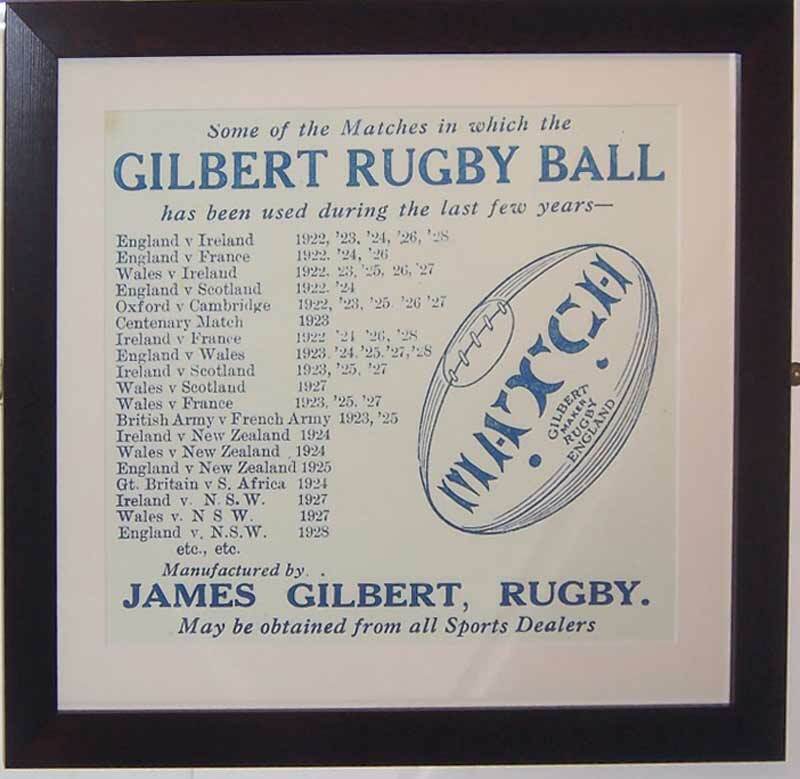 A modern photographic reproduction print of a Gilbert ball advertisement 1928. 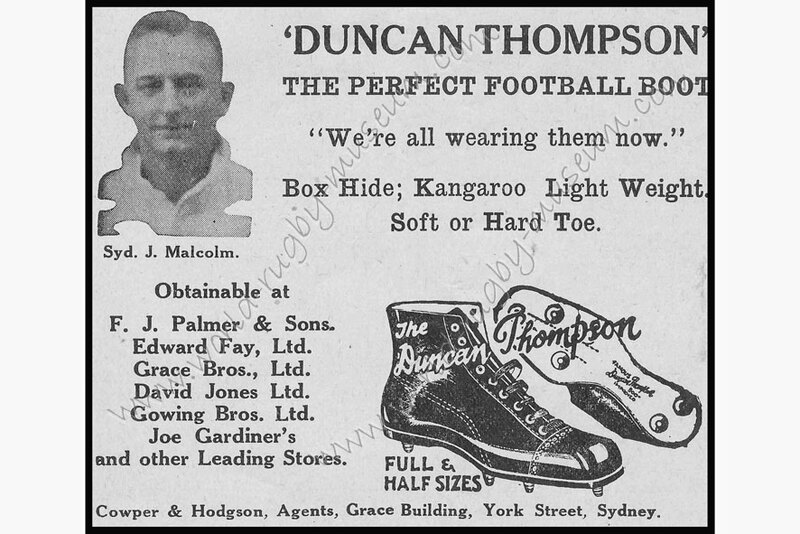 A modern photographic reproduction print of a Kangaroo Hide Boot advertisement 1934. 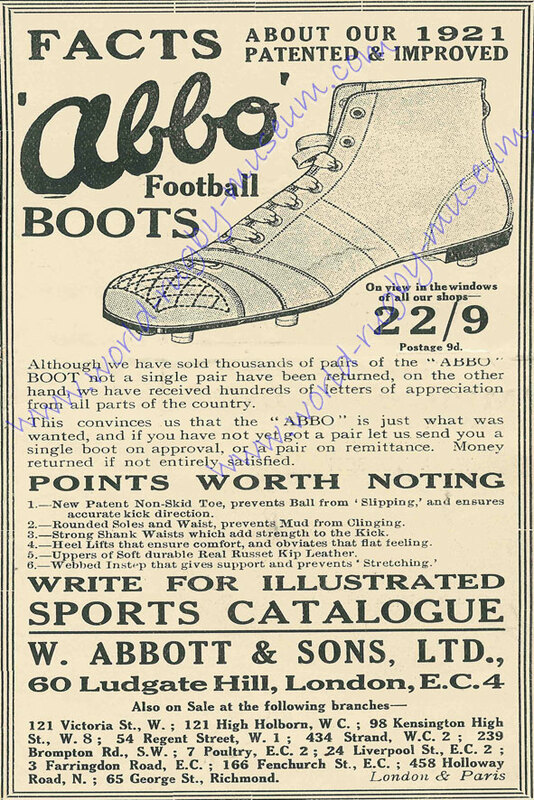 A modern photographic reproduction print of an 'Abbo Boots' advertisement 1922. 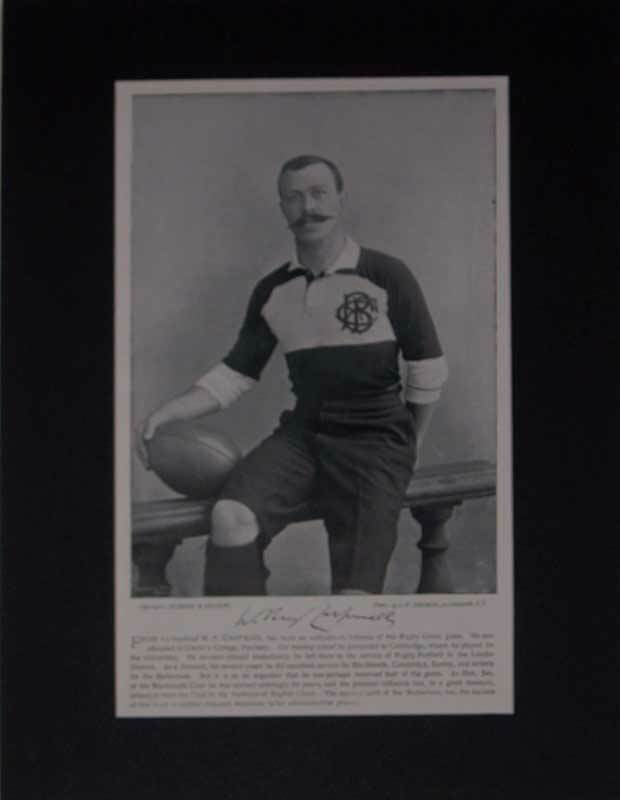 A modern photographic reproduction print of an Arthur Gould print. 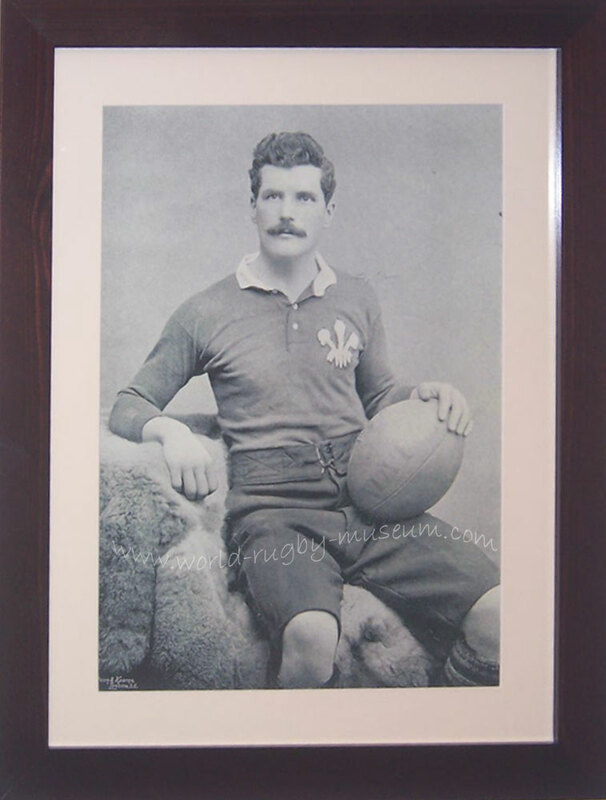 Arthur Gould was Welsh rugby's first super star. 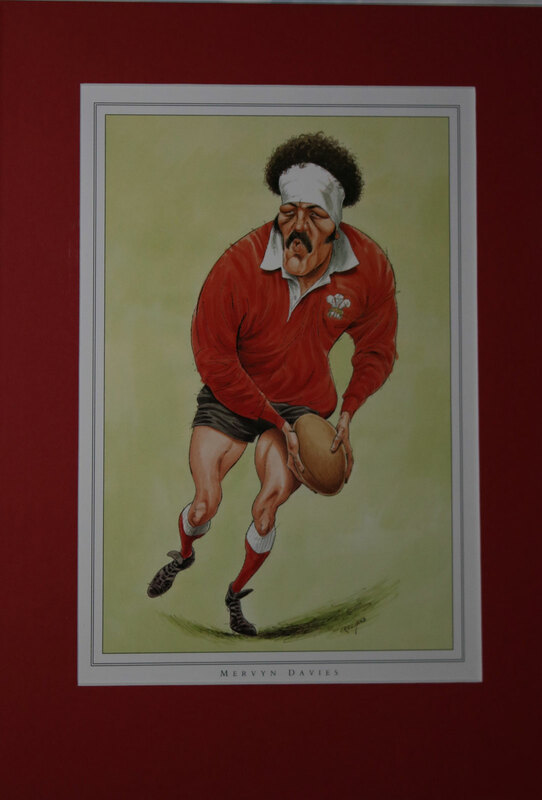 He was the man who put Wales on the rugby map. 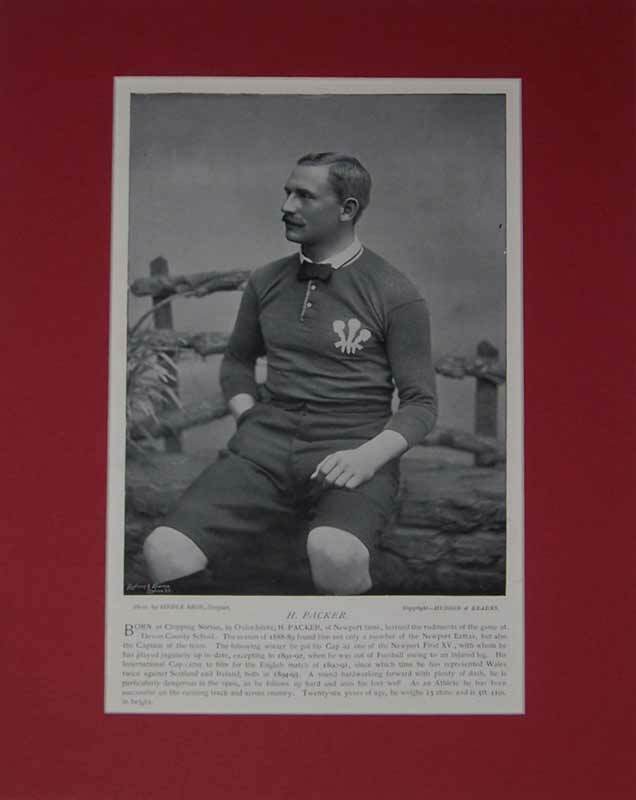 When he began playing for Wales in 1885, it was only her 8th international and only two wins had been recorded. 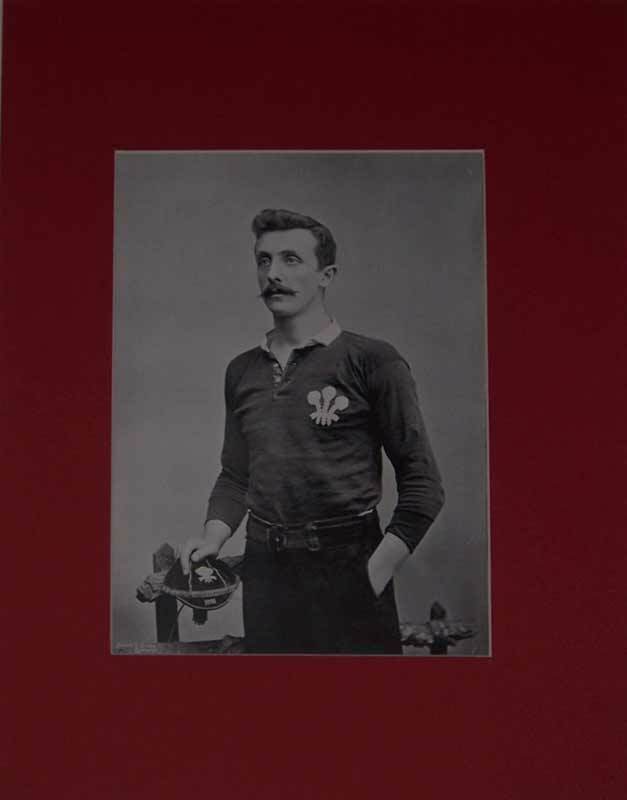 When he finally retired from international rugby in 1897, Wales had won her first Triple Crown; Welsh clubs were regularly beating English, Scottish and Irish opponents; and the players who were to usher in the first Golden Era were starting to take their place in the national XV. 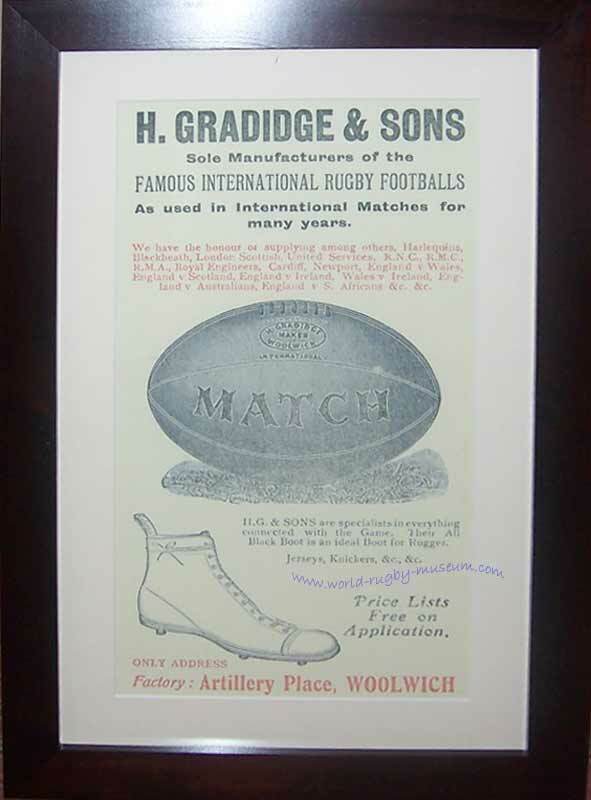 A modern photographic reproduction print of a 1912 Gradidge advertisement for balls & boots. 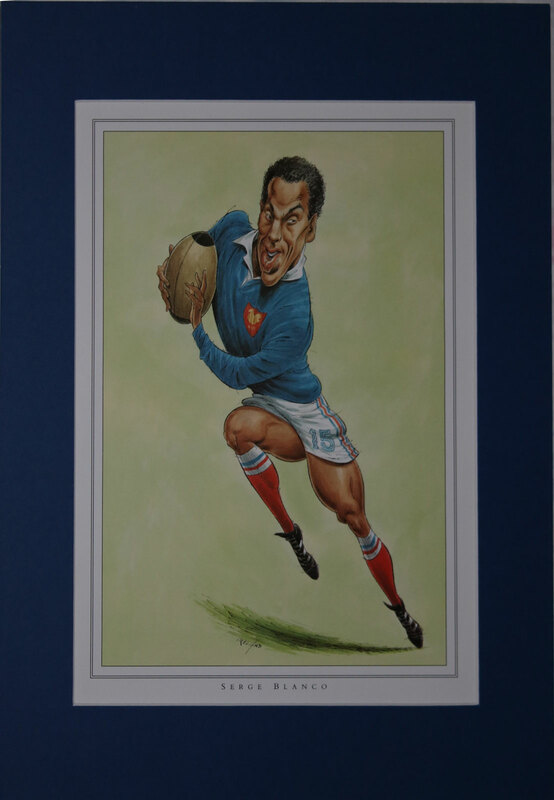 Framed, total size including frame 26" x 18" (44 x 66cm). 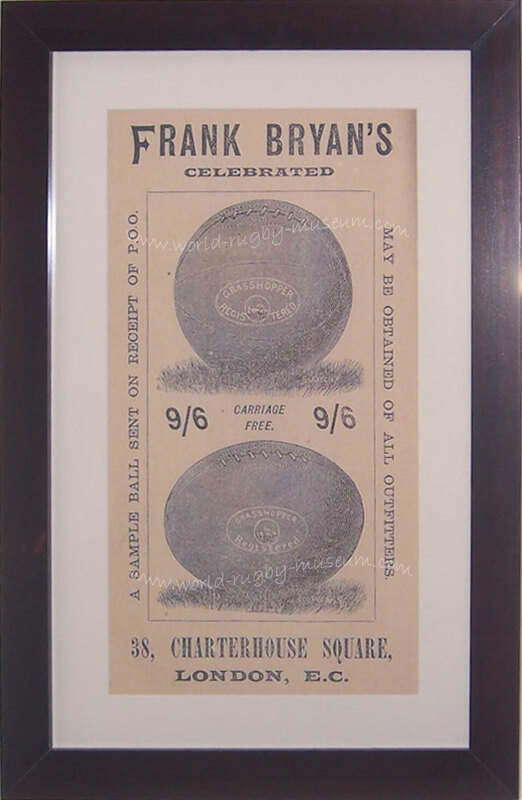 A modern photographic reproduction print of a Bryan's advertisement 1896. 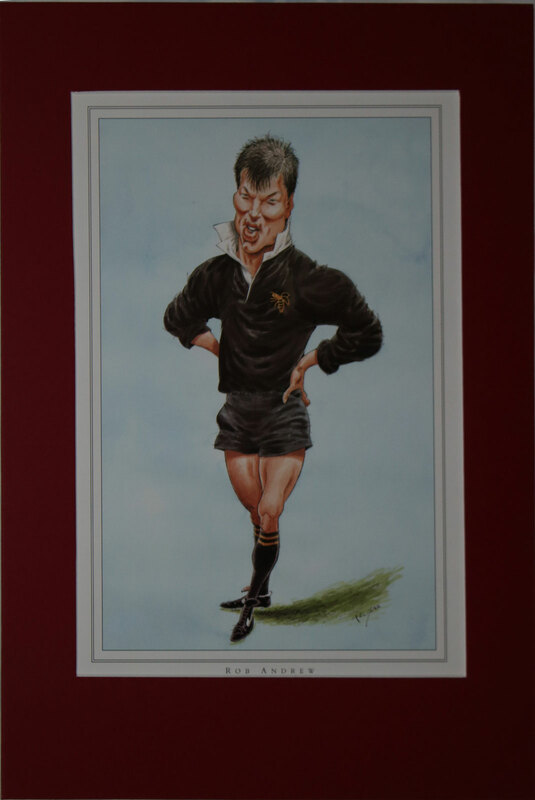 Total size including frame 27" x 18" (45 x 68cm). 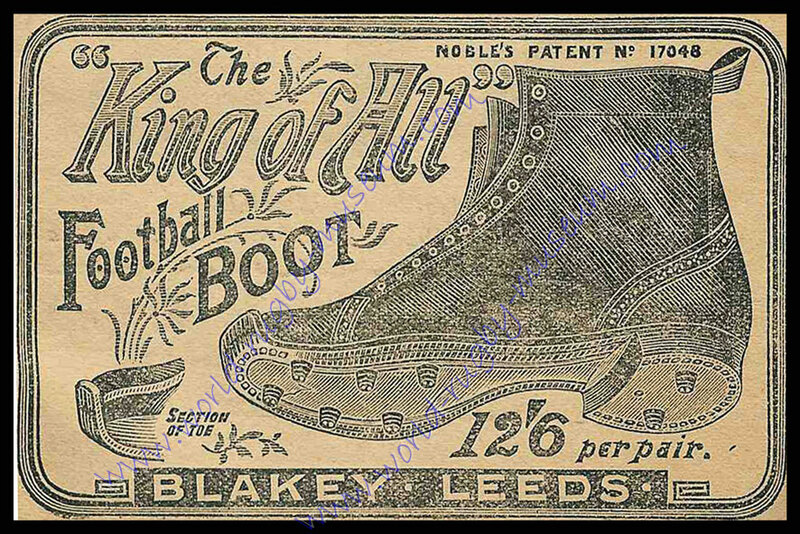 A modern photographic reproduction print of a 'King of All Football Boot' advertisement 1896. 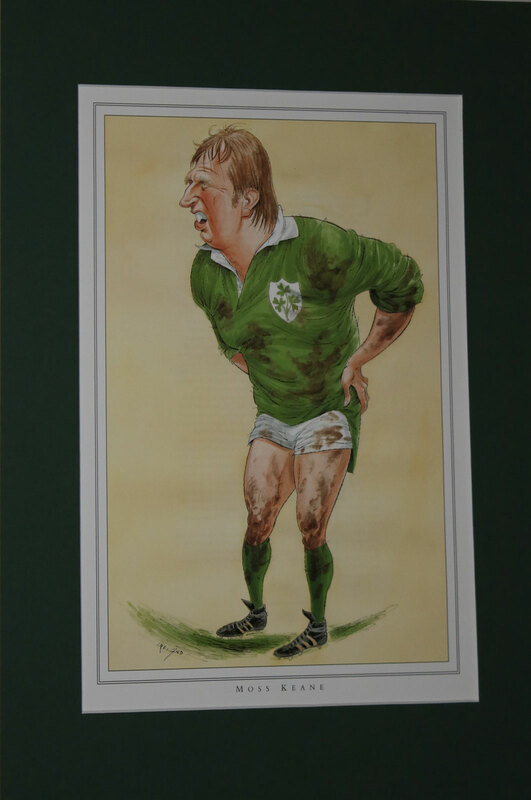 The total size including frame is 27" x 19" (68 x 49cm). 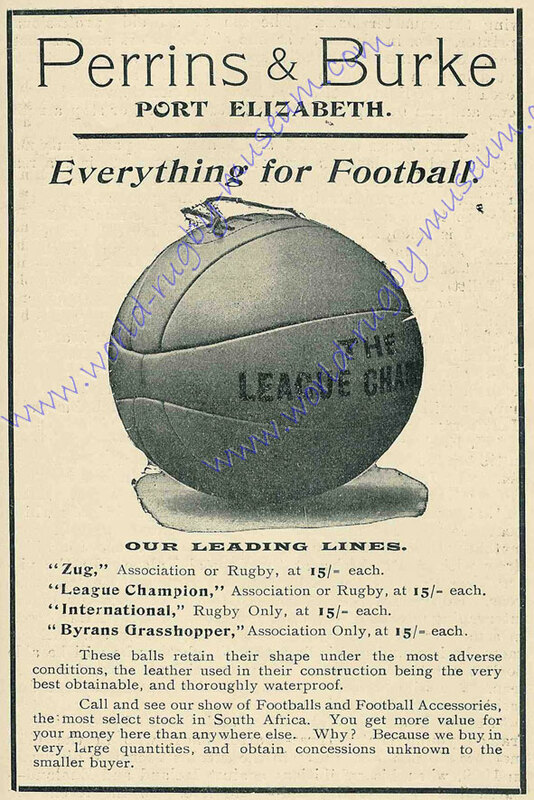 A modern photographic reproduction print of a 'Perrins & Burke' ball advertisement 1910. 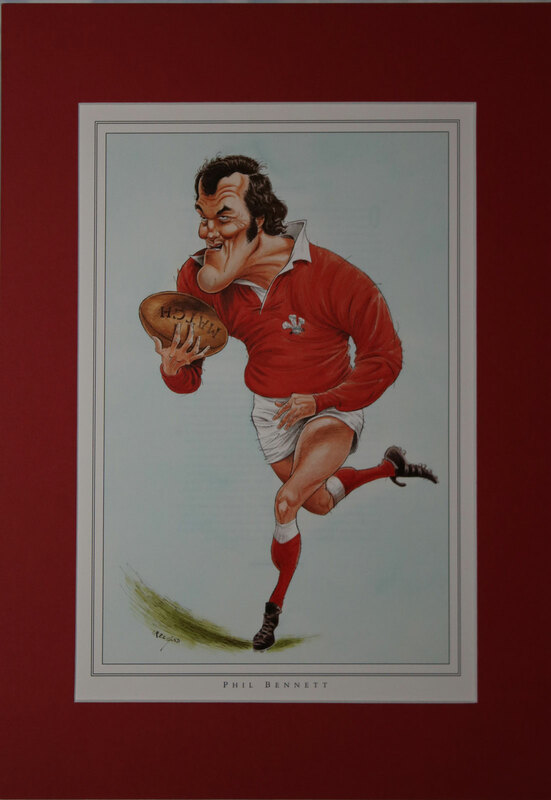 The total size including frame 27" x 19" (49 x 68cm). 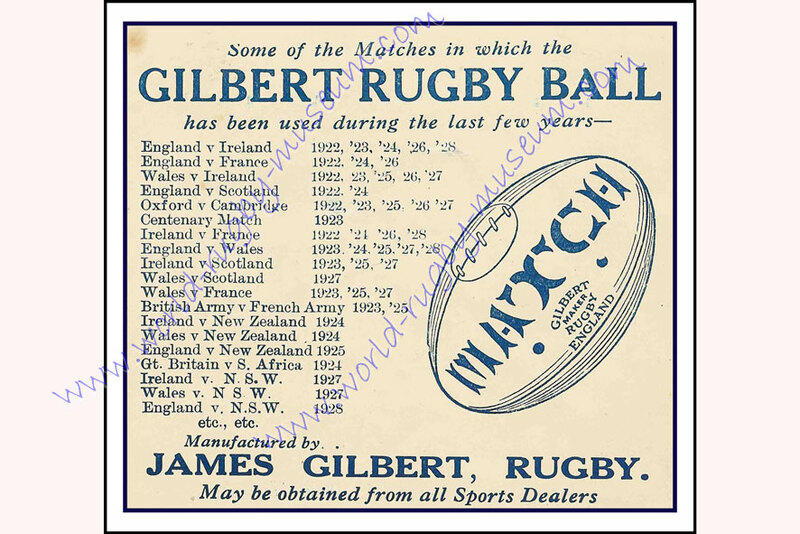 A modern photographic reproduction print of a Gilbert ball advertisement 1928. 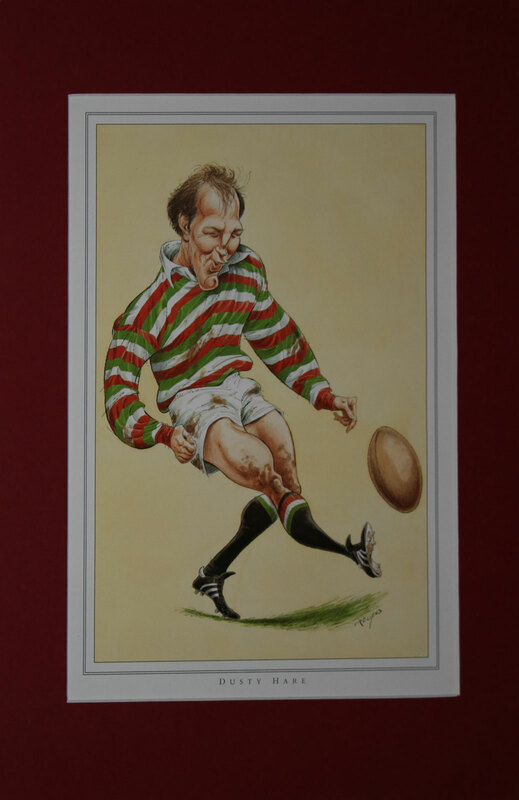 The total size including the frame is 26" x 24" (65 x 60cm). 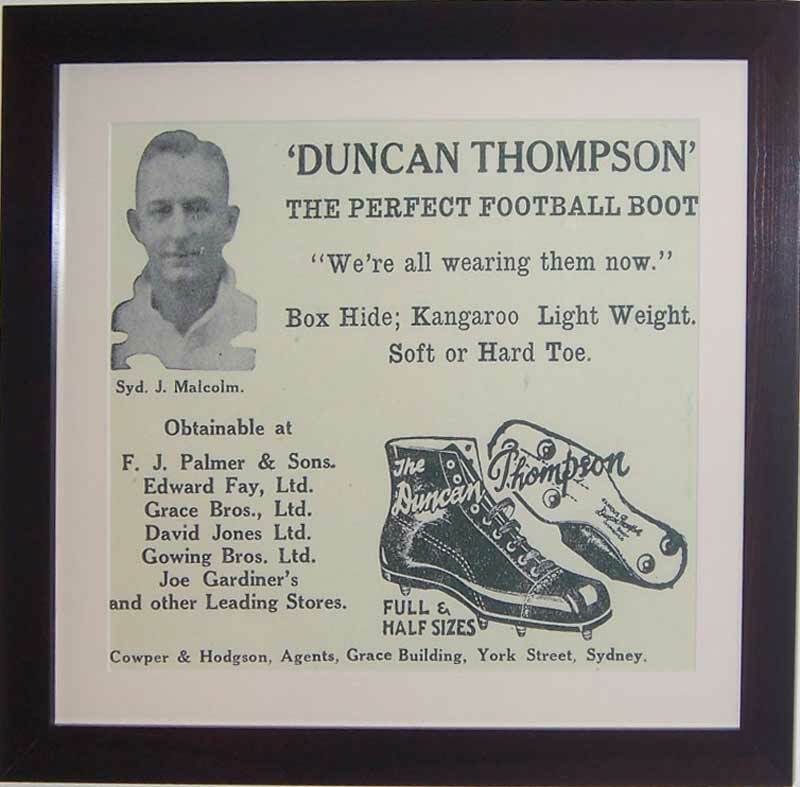 A modern photographic reproduction print of a Kangaroo Hide Boot advertisement 1934. 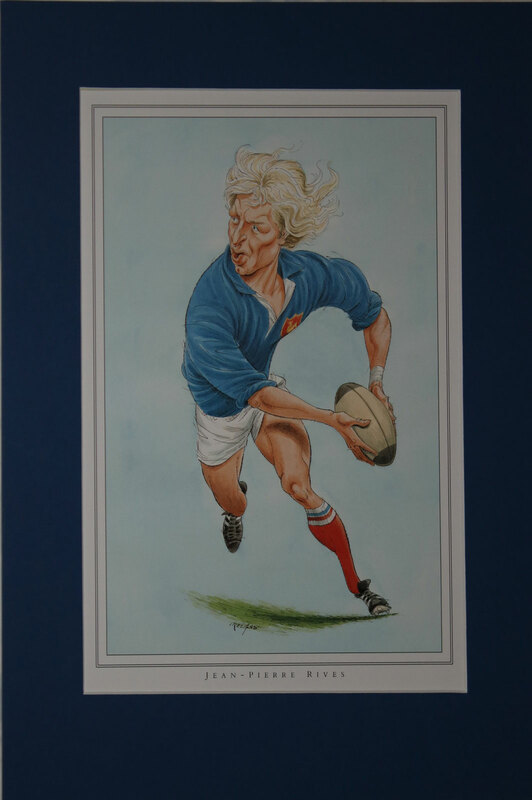 The total size including frame is 26" x 23" (66 x 58cm). 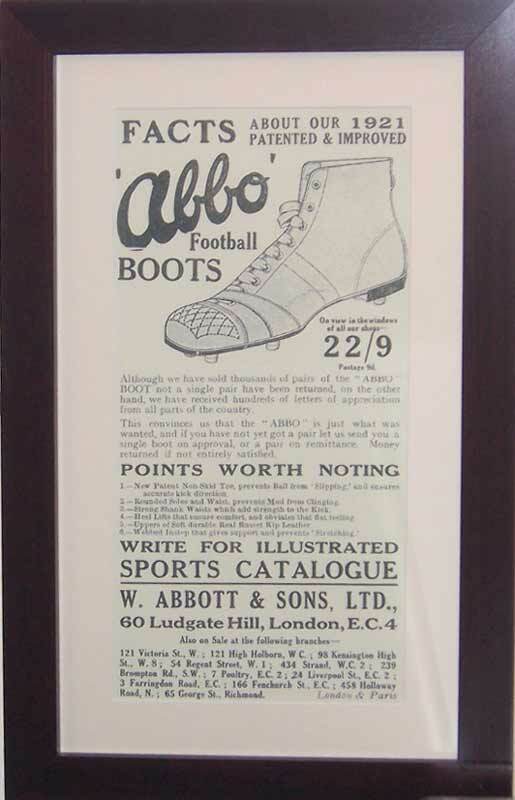 A modern photographic reproduction print of a 'Abbo Boots' advertisement 1922. 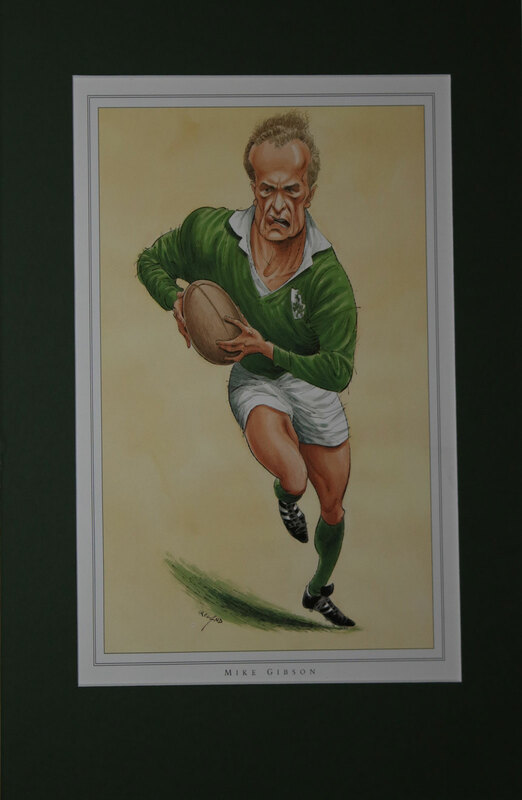 The total size including frame is 26" x 16" (41 x 65cm). 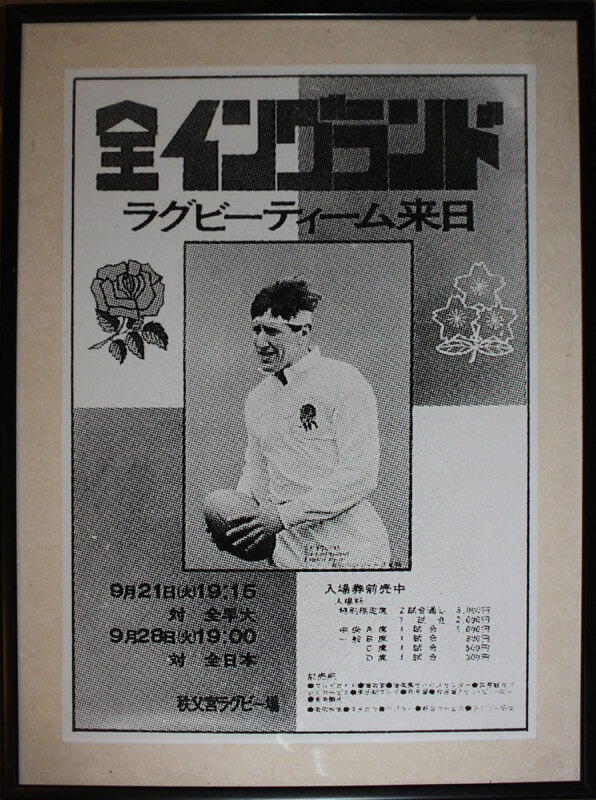 Framed and glazed b&w enlargement of the front cover for the Japan v England 1972 programme. 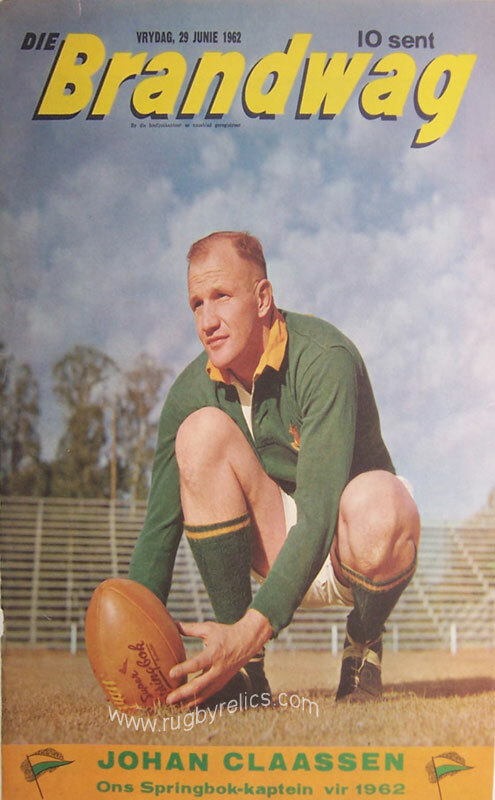 The illustration shows Budge Rogers with the ball. 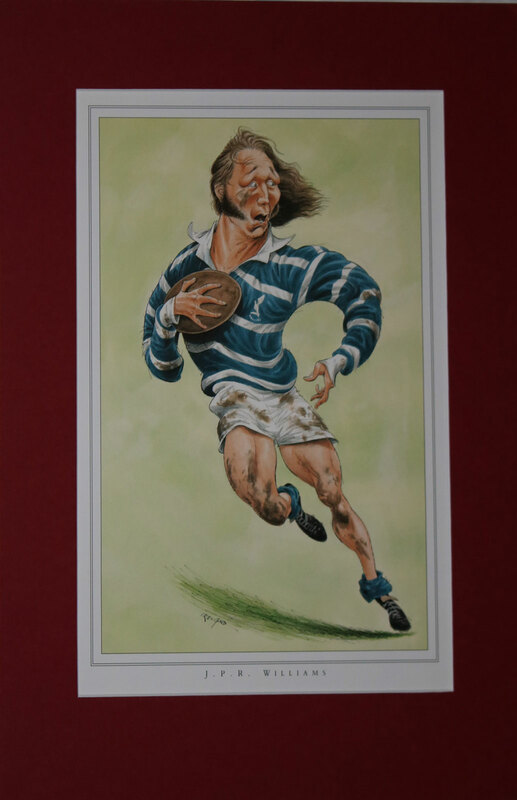 Framed and glazed, total size, approx 24" x 18". 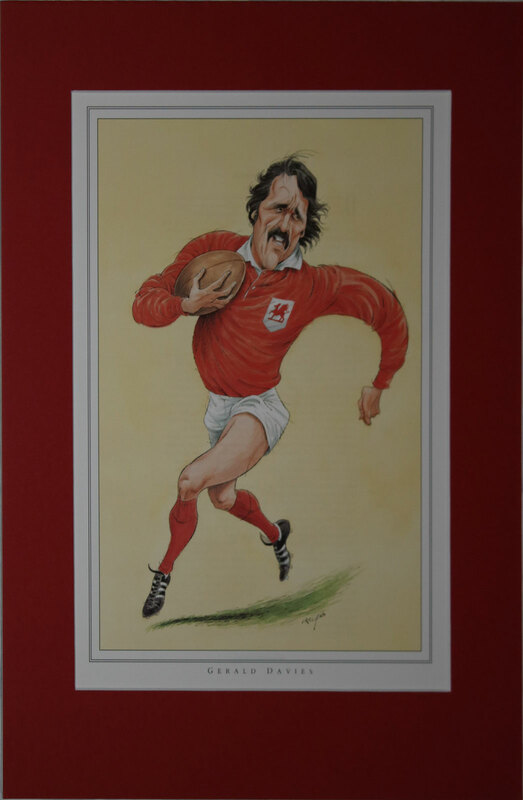 A limited edition print of former Neath & Wales captain Paul Thorburn. 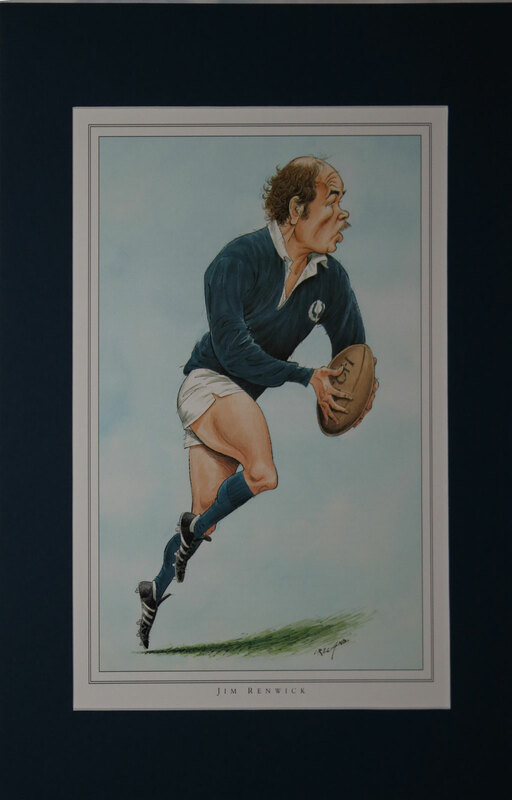 Signed by both Thorburn and artist Jeffrey Williams. 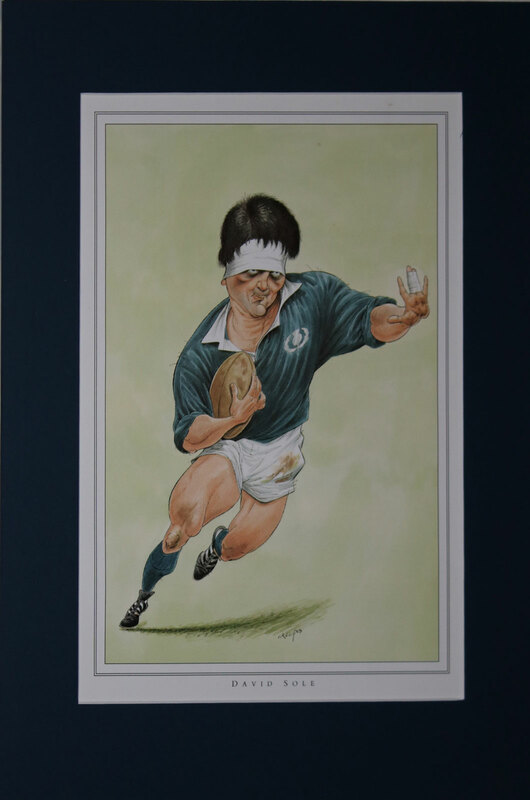 The Last Five Nations Championship 1999 - A fantastic illustration by 'KT' featuring the leading players of the last ever 5 Nations Championship in the year 1999. 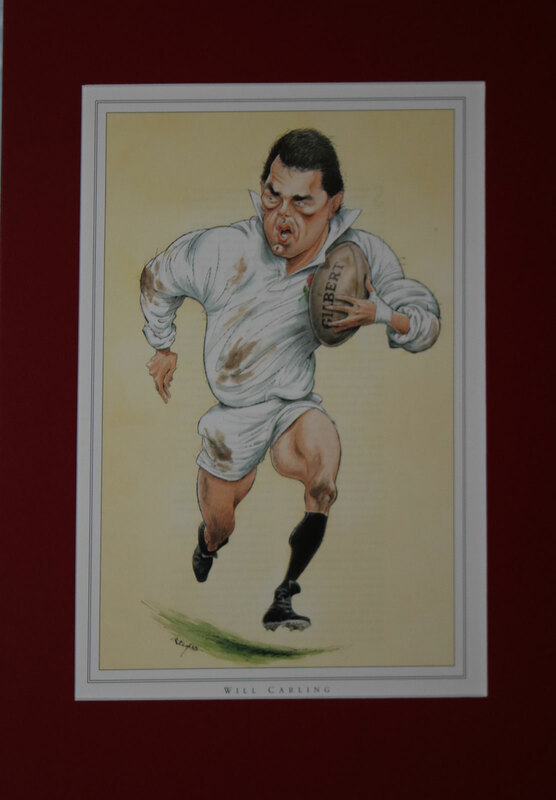 The players illustrated include, Keith Woods (Ireland), Lawrence Dallaglio, Jeremy Guscott & Martin Johnson, (England), Neil Jenkins, Rob Howley & Scott Gibbs, (Wales), Gregor Townsend (Scotland). 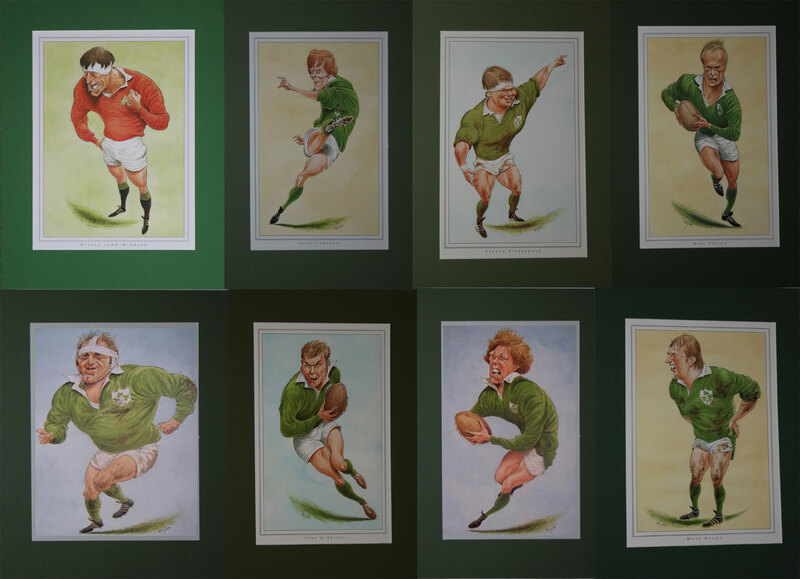 Players from all of the 5 Nations are represented on this great print. 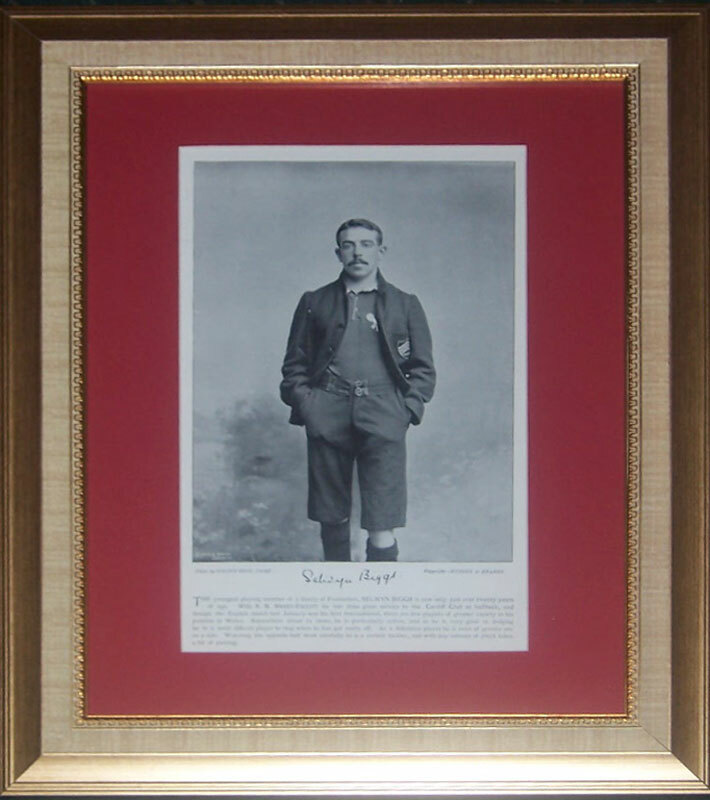 The print is mounted in a red surround and is ready for framing. 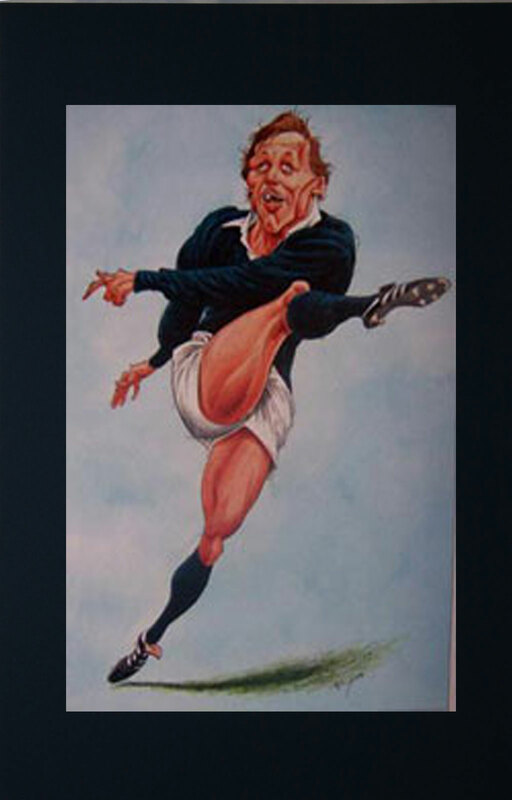 The total size of this print including the mount is 51cm x 40cm (20" x 16"). 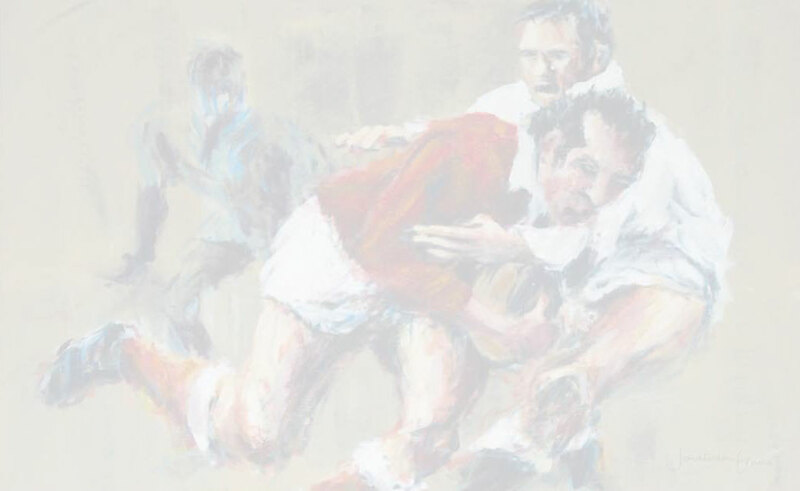 The Six Nations Championship 2000 - A fantastic illustration by 'KT' featuring the leading players of the 1st ever 6 Nations Championship in the year 2000. 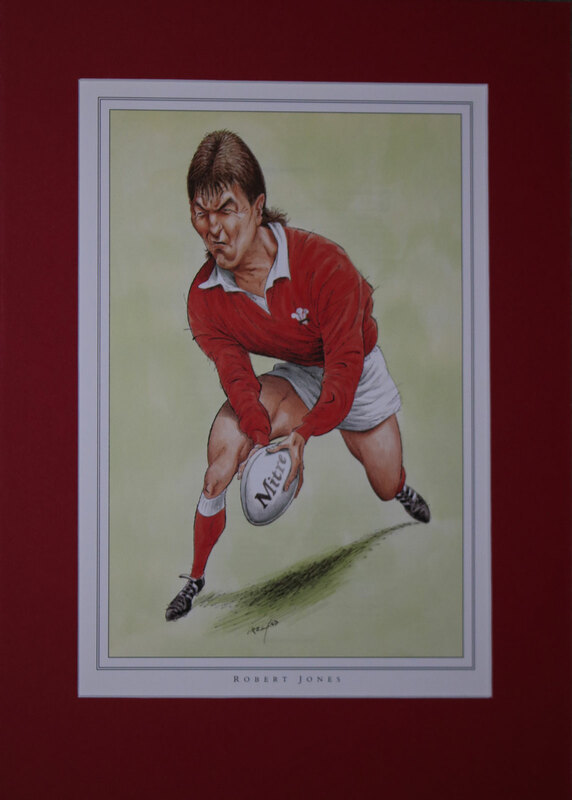 The players illustrated include, Keith Woods (Ireland), Lawrence Dallaglio & Martin Johnson (England), Neil Jenkins & David Young (Wales). 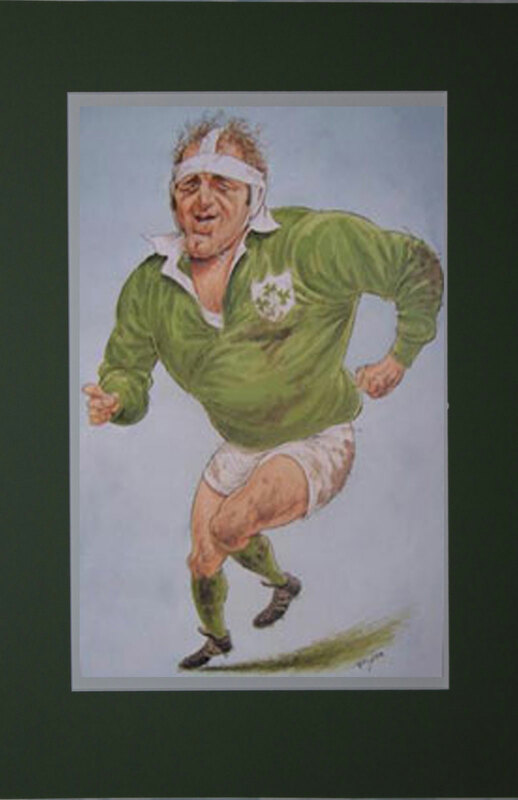 Players from all of the 6 Nations are represented on this great print. 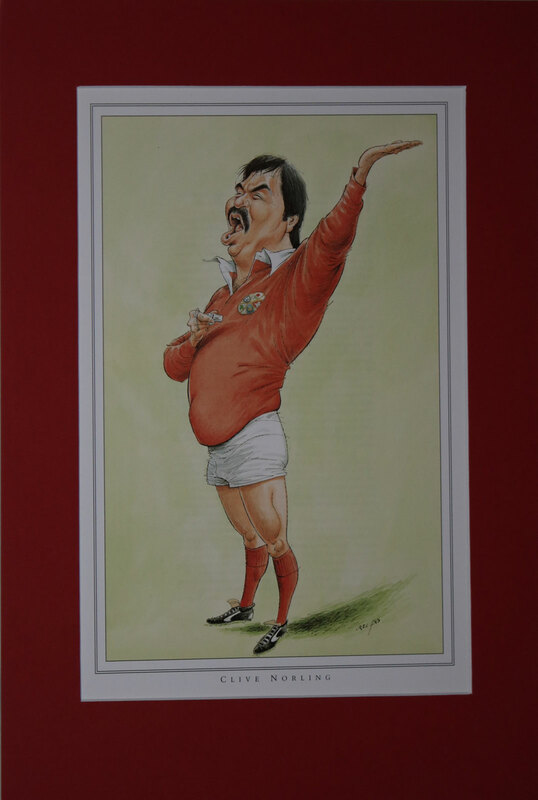 The print is mounted in a red surround and is ready for framing. 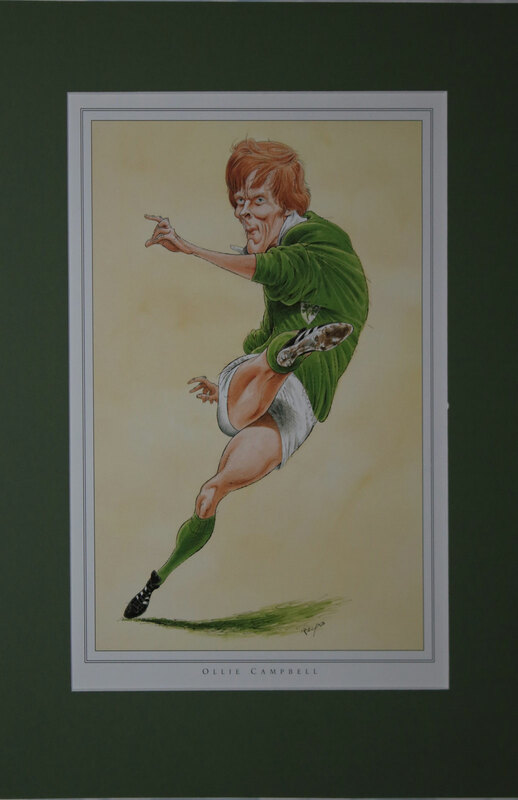 The total size of this print including the mount is 51cm x 40cm (20" x 16"). 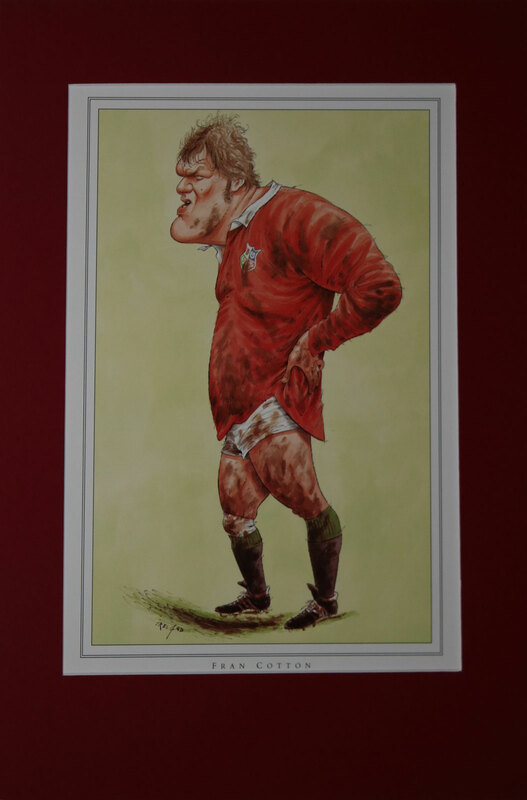 Wales Rugby World Cup 1999 - The players illustrated are Alan Bateman, Rob Howley, Scott Gibbs, Neil Jenkins, Scott Quinnell & Shane Howarth. 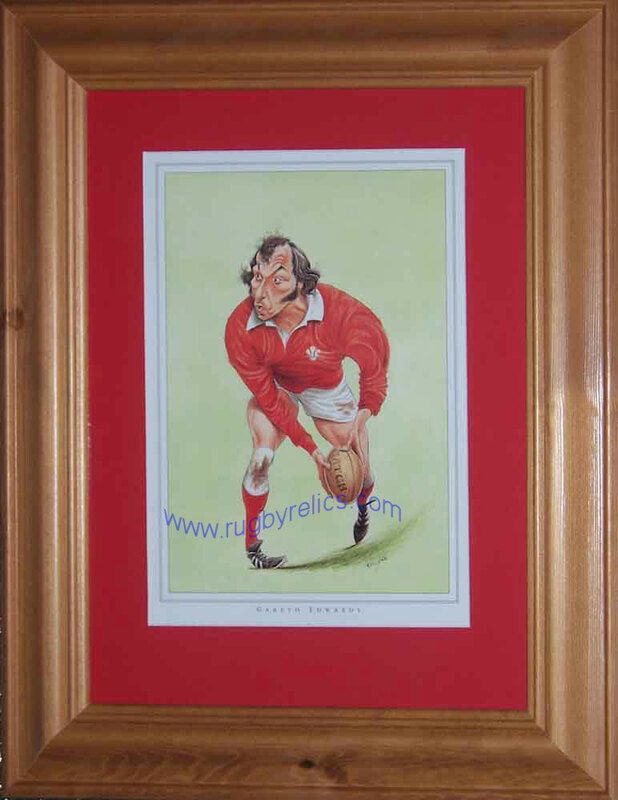 The print is mounted in a red surround and is ready for framing. 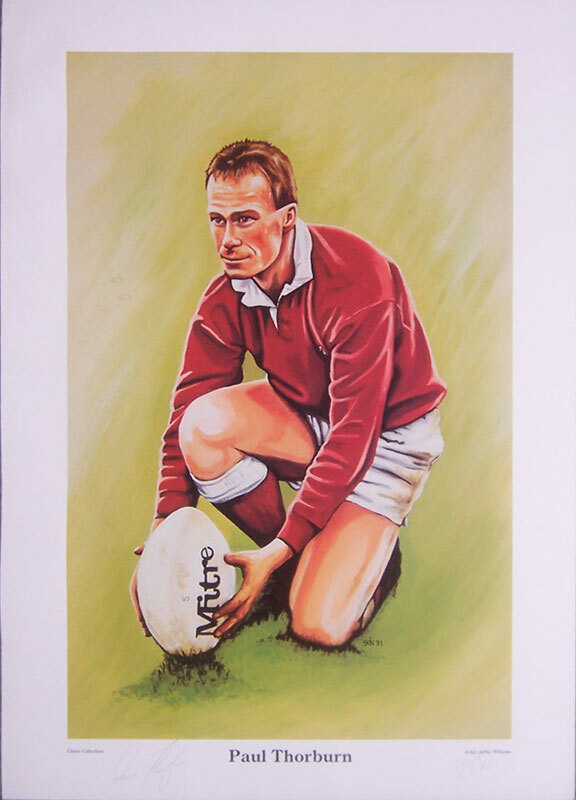 The total size of this print including the mount is 51cm x 40cm (20" x 16"). 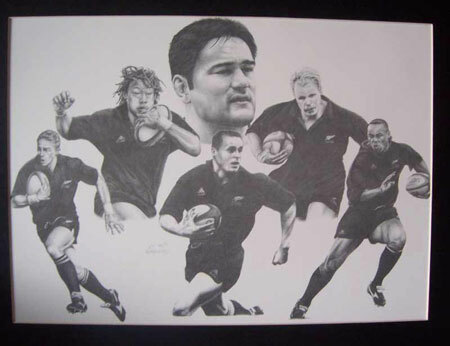 New Zealand All Blacks Rugby World Cup 1999 - A fantastic illustration by 'KT' featuring leading All Black players of the 1999 Rugby World Cup. 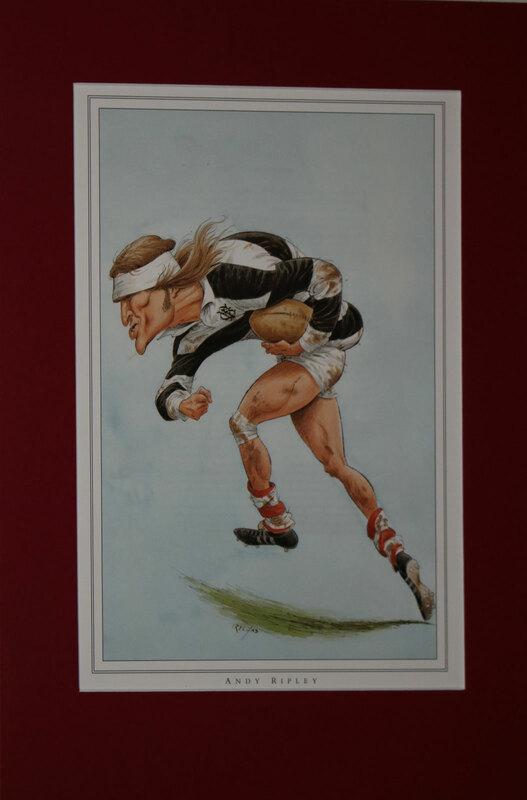 The players illustrated are Taine Randell, Justin Marshall, Tana Umaga, Christian Cullen, Jeff Wilson & Jonah Lomu. 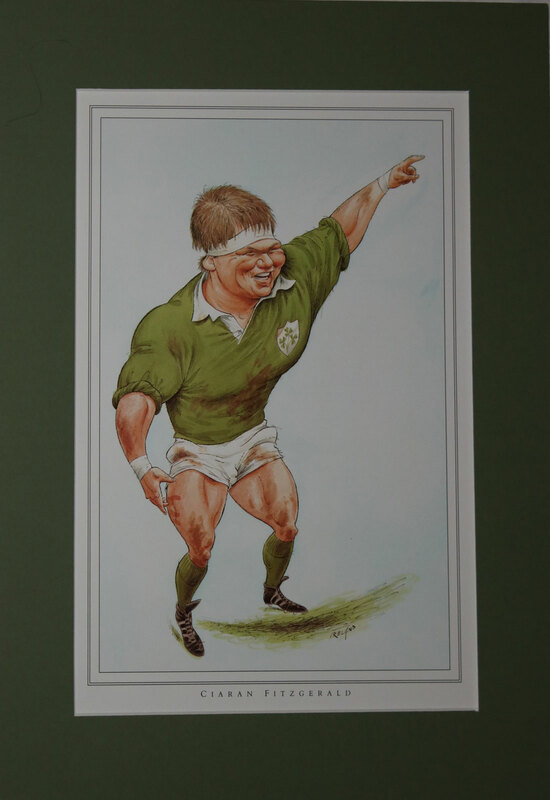 The print is mounted in a black surround and is ready for framing. 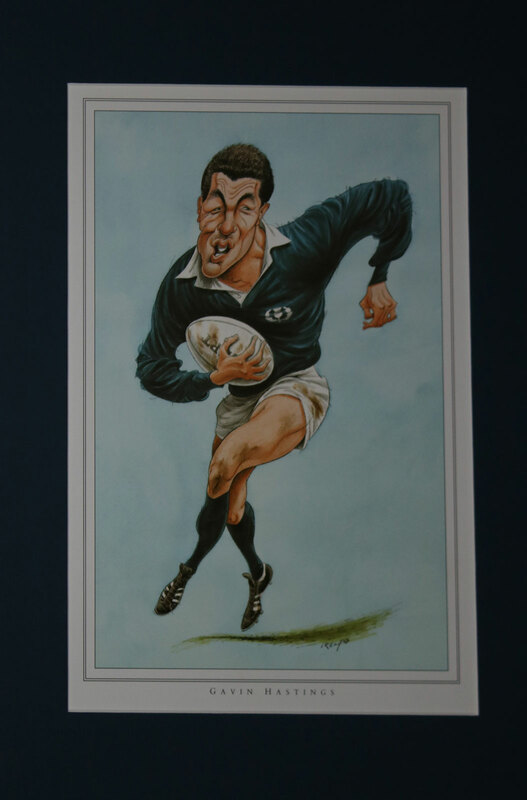 The total size of this print including the mount is 51cm x 40cm (20" x 16"). 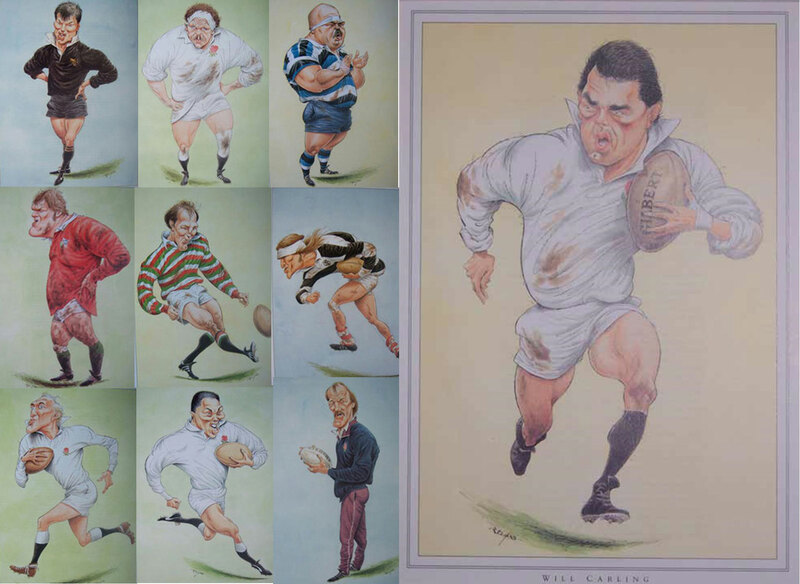 Original plates from John Ireland's 'Rugby Caricatures' published in 1990. 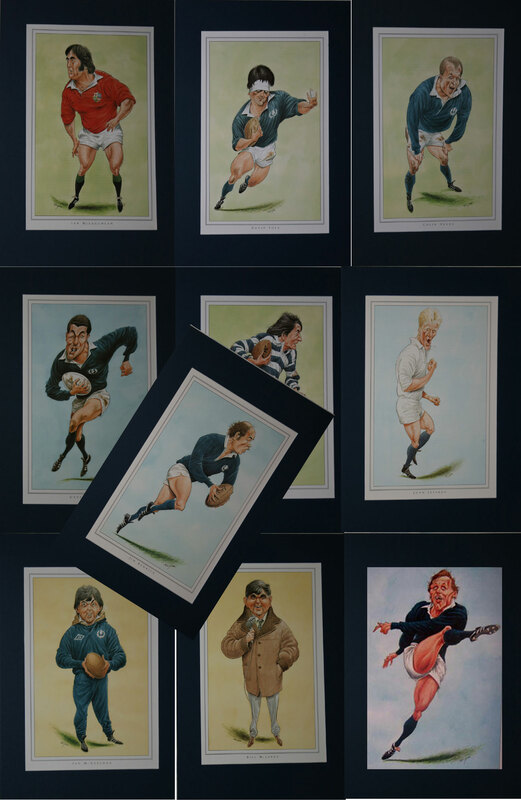 Each print is mounted, ready for framing. 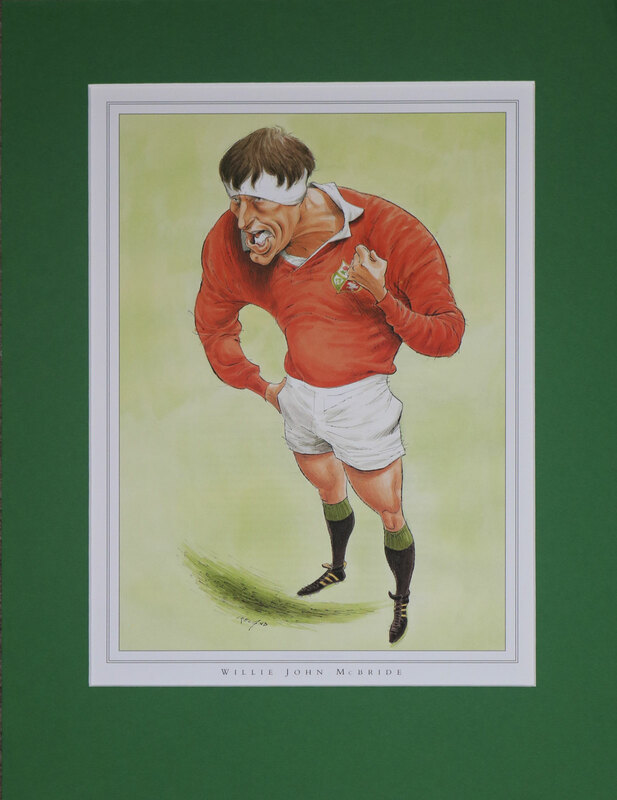 The total size of each print including the mount is 16" x 12" (41cm x 30.5cm).